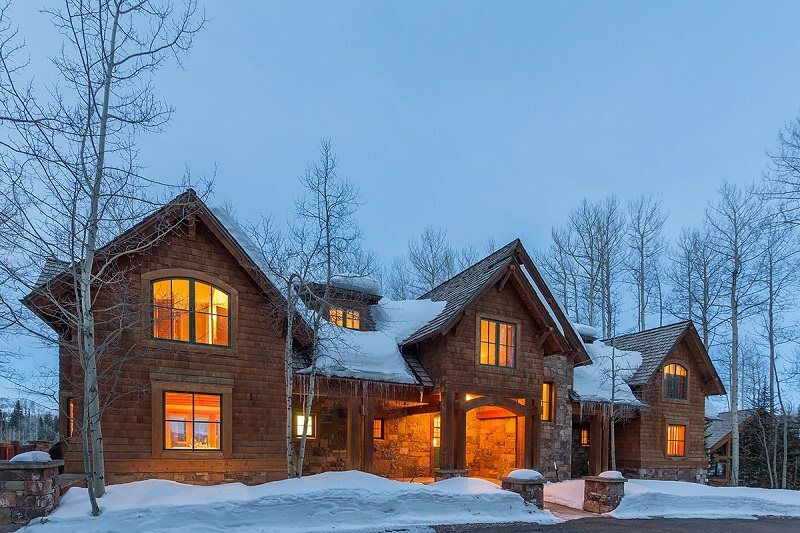 Single family and large vacation homes located throughout Telluride and Mountain Village. 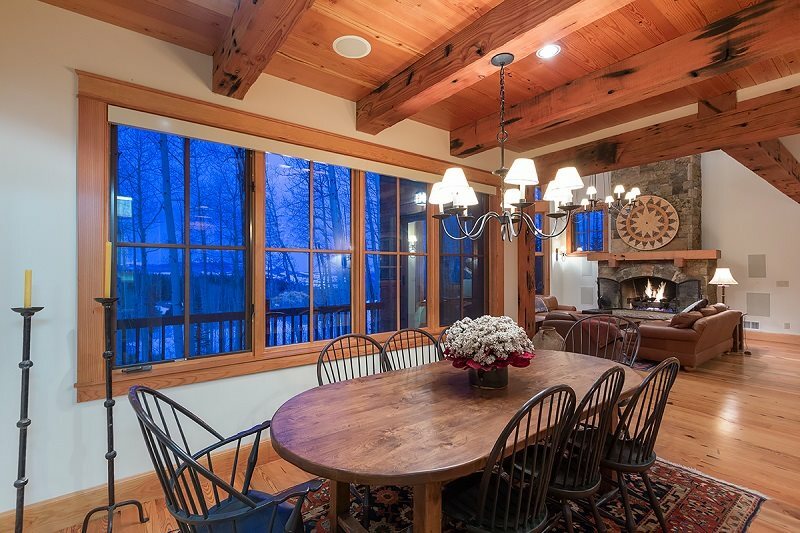 This is an ideal property for families, multiple families who want to have a true mountain ski home experience. 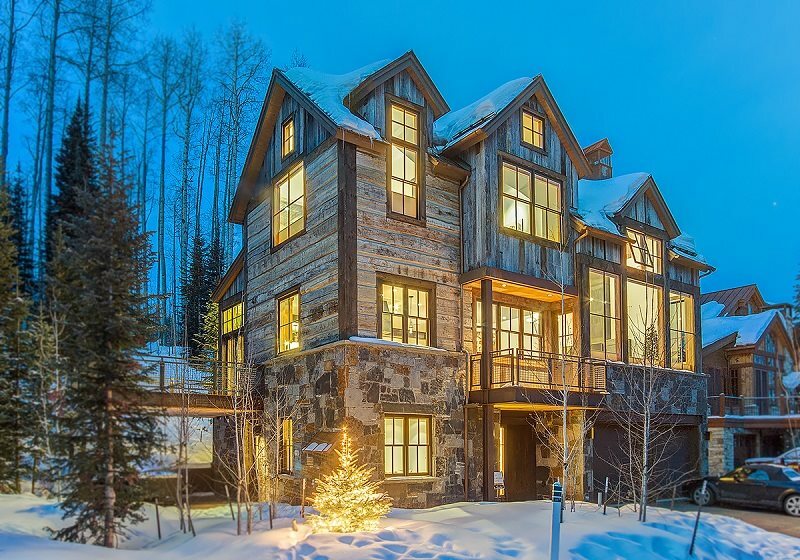 The Telluride Ski Resort, Bridges ski run is easily accessed by skiing out of the property, or walking the equivalent of 2 short blocks to/from the ski run. 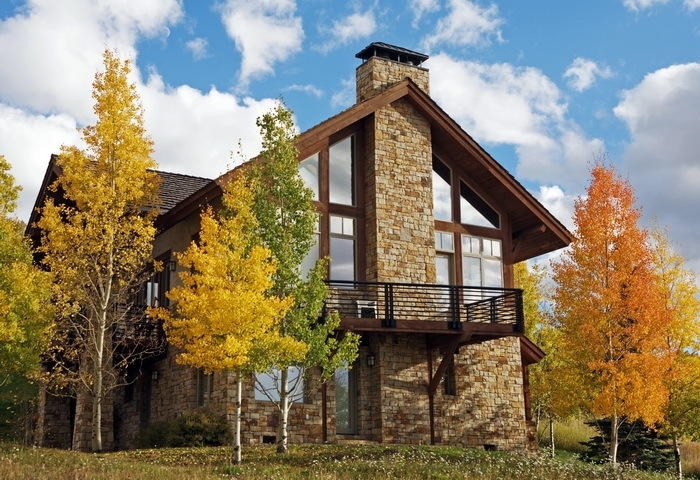 This is also a great summer getaway home with hiking trails right out your door. 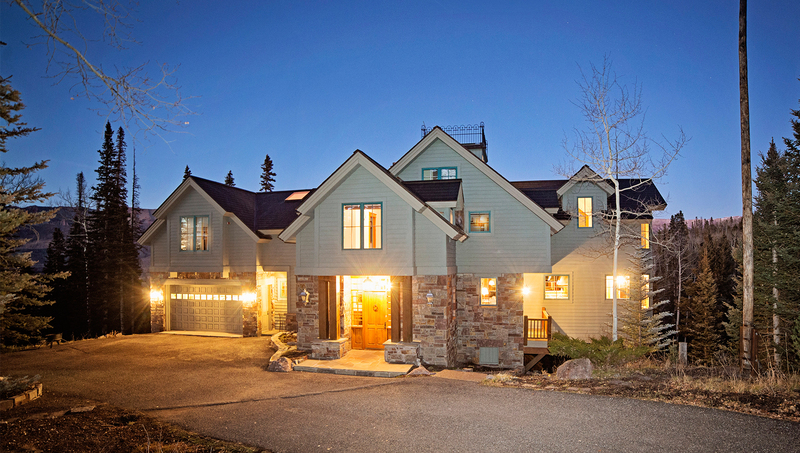 This luxurious Mountain Village rental home is located on the Telluride Golf Course and offers sweeping views in a mountain modern setting. â€¢ Spectacular Views of San Sophia Ridge. Beautiful Sunset and Sunrise Views! 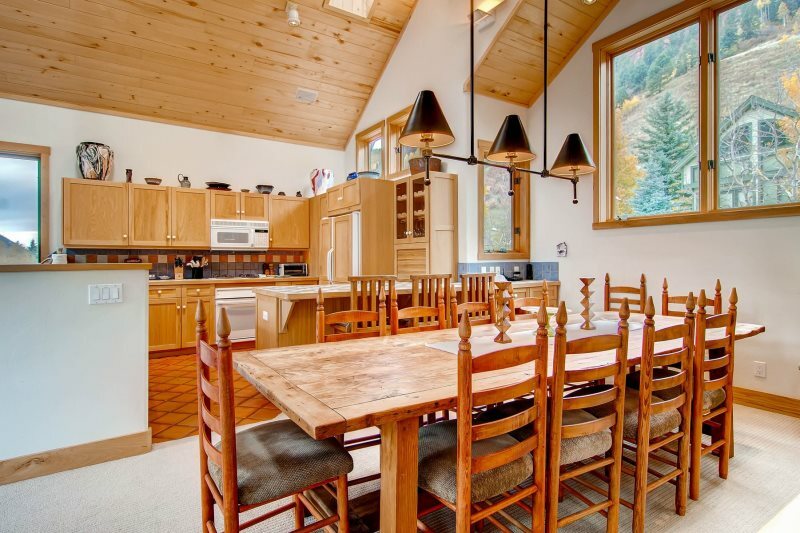 This is a rental home for all seasons and so close to the Gondola. 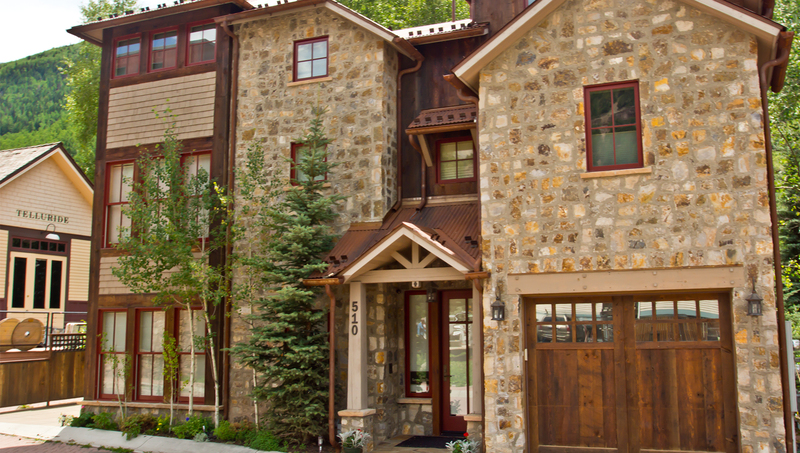 Located in Mountain Village, 20 Trails Edge offers a true ski-in ski-out experience with the convenience of walking to the Gondola and the luxury of a brand new home. 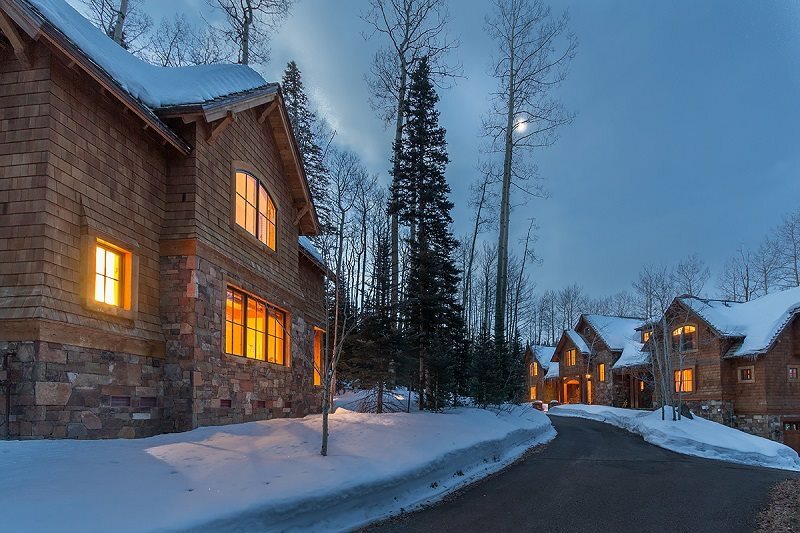 Enjoy this fully equipped Telluride home that includes media room, hot tub, pool table, sauna and TRUE SKI IN SKI OUT access! 5TH BEDROOM: Two twin beds located on lower level, shares bathroom with bunk room. 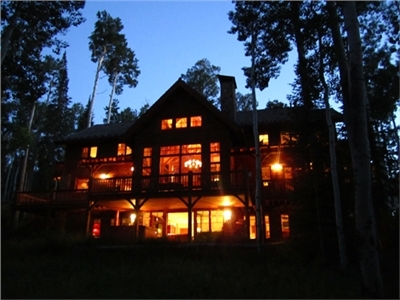 This 5 bedroom + 1 small bedroom, 4 bath home has 3 additional beds and easily sleeps 15 guests. Pets: Yes - $300 Pet Cleaning Fee - Pets must be approved at booking by manager in writing. Guests must also complete pet waiver at booking. 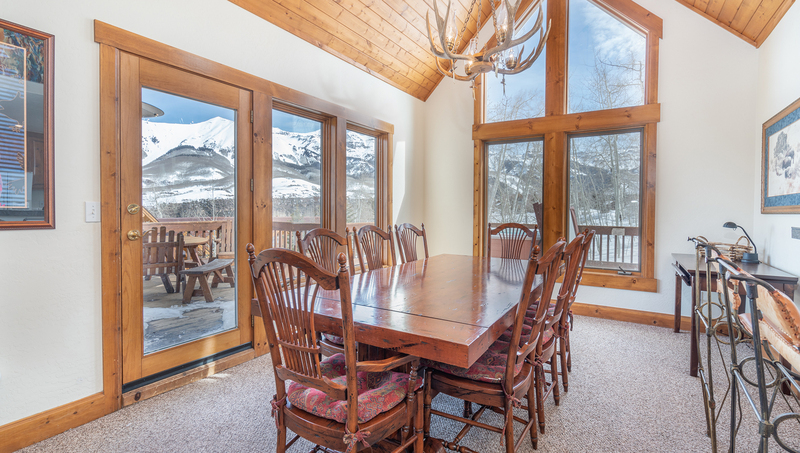 The second floor Great Room, Dining Room and Kitchen features big, sunny views of the ski area and a south facing deck with a gas grill. The Great Room is perfect for entertaining large groups. 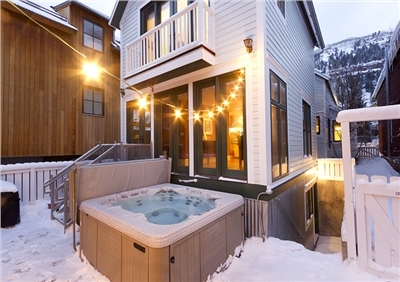 One unique aspect of this rental home is the 6 person hot tub on the home's roof with unbelievable 360 degree views of the Telluride Ski Area, Box Canyon and San Juan Mountains. 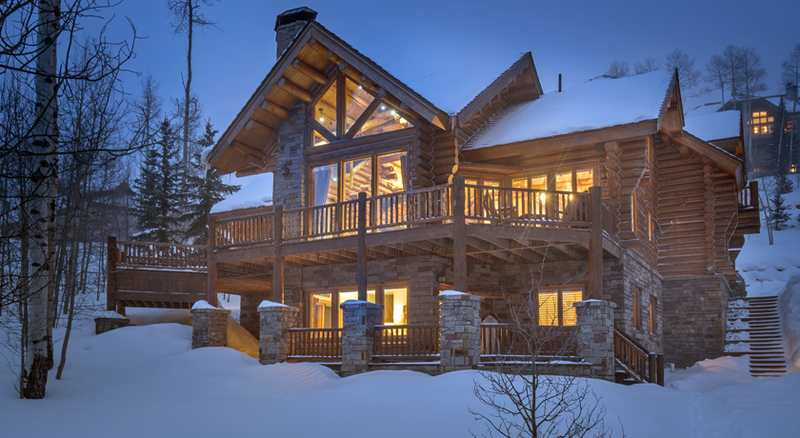 Perfect for families, skiers, golfers, weekend getaways or extended stays winter and summer! 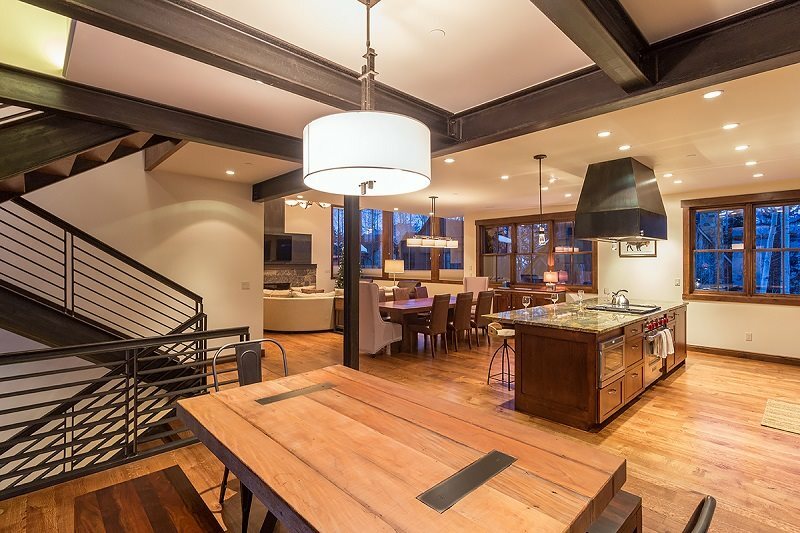 Mountain contemporary meets Historic Telluride in this three-bedroom private home on West Pacific Avenue that underwent an award-winning remodel just a few years ago. 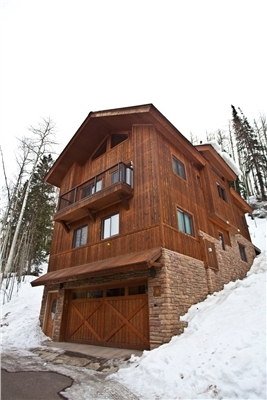 Located only two blocks from the free Gondola in a quiet, residential neighborhood. Behind a Rockwell'esque white picket fence and gate, the front door to 558 West Pacific takes you into the warm and inviting living room. 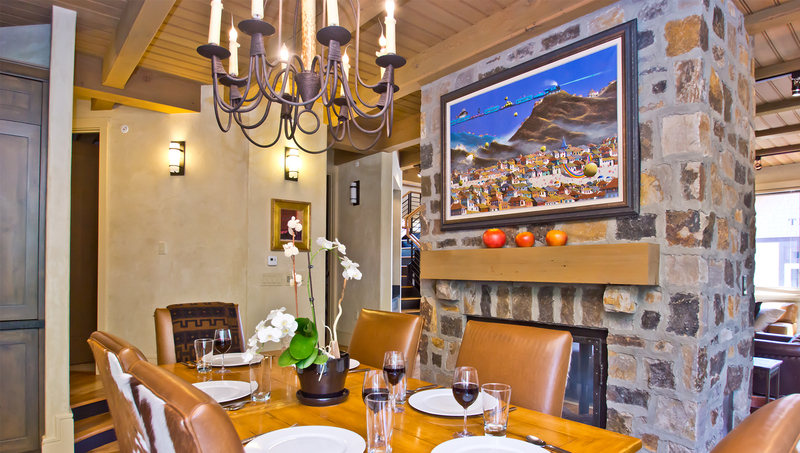 Featuring leather furniture, original artwork, sophisticated wood floors and a modern gas fireplace, this room is the ideal location for lively conversations with family and friends. 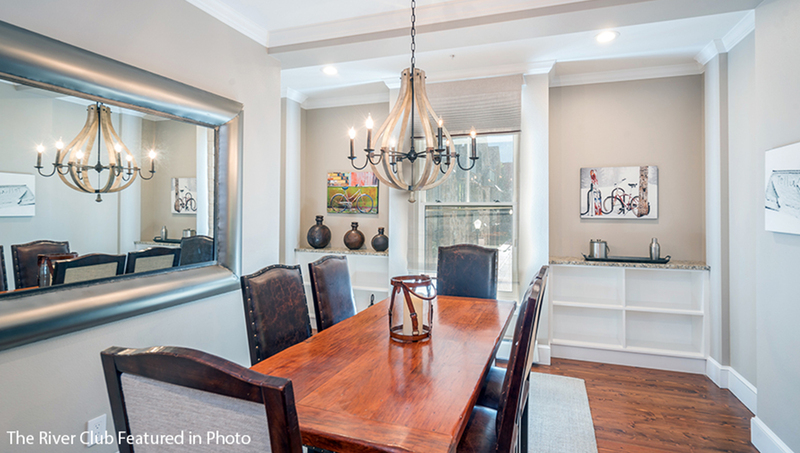 Adjoining the living room is the breakfast nook, furnished with a bistro table and four chairs. 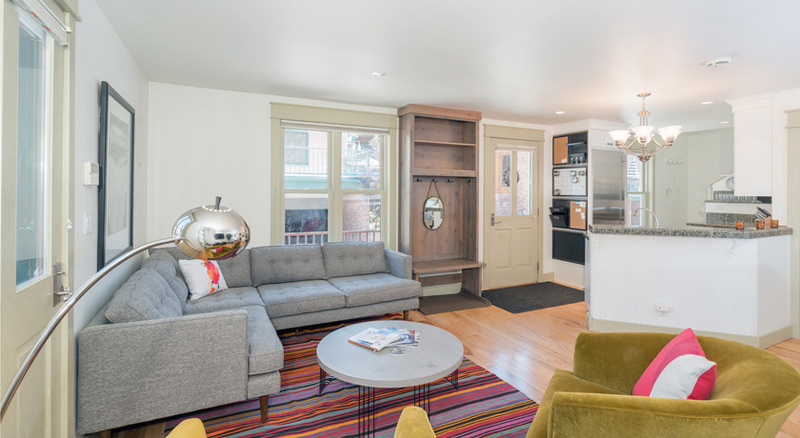 When not being used for dining purposes the nook is the perfect venue for working on a Telluride jigsaw puzzle or battling it out in a marathon game of Monopoly. Moving south through the home you next enter the fully-equipped galley kitchen, complete with ample counter space, a large country style sink and stainless steel appliances. 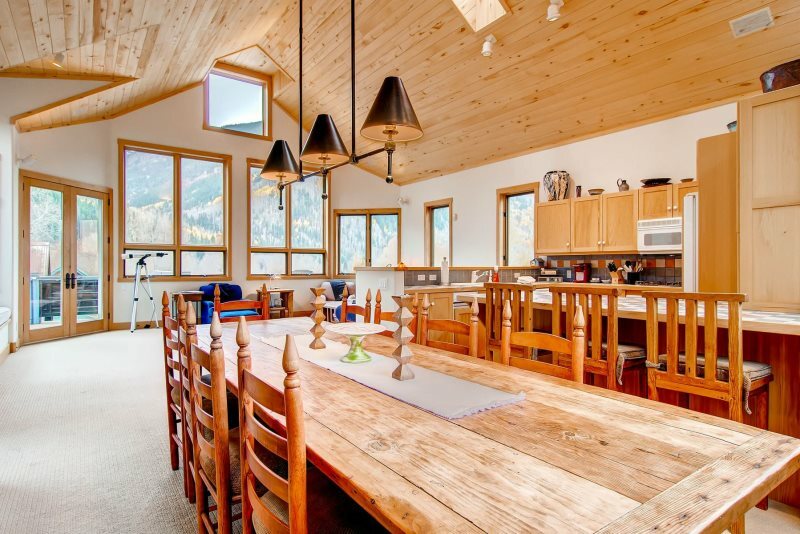 Beyond the kitchen is the dining room featuring a large table with seating for six and a plethora of windows that bring the natural light and mountain views indoors. The private back patio is accessed from this room. The patio has deck furniture, a gas grill and a private hot tub. Behind the patio is the one-car garage and off-street parking spaces that can accommodate one additional vehicle. Back in the breakfast nook you will find the stairs leading to the upper level. At the top of the stairs is the shared bathroom with pedestal sink and a standup shower. To the left is the Guest Master Suite, with Queen bed, flat screen TV, loads of storage and en suite access to the shared bath. Moving south in the upper hall leads you to the Master Suite. First encountered is the en suite with a double sink vanity, a large soaking tub, a luxurious steam shower and multiple sky lights to brighten the space. The Master bedroom features a King bed, a flat screen TV and a private balcony. Returning to the kitchen you will find the stairs leading you to the basement level that features twin bunk beds and a sleeper sofa. A large flat screen TV makes this room the ideal spot for a family movie night or a playroom for the kids. The bathroom has a standup shower and the private laundry facilities are located on this lower level. 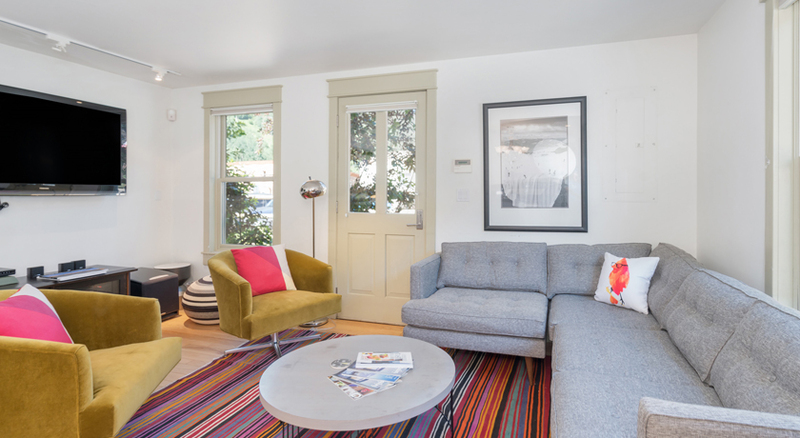 This historic home is equipped with Wireless Internet, Cable TV and offers parking for up to two vehicles. No matter the time of year, seasoned travelers will appreciate the convenience and the quiet residential neighborhood that this private home enjoys. 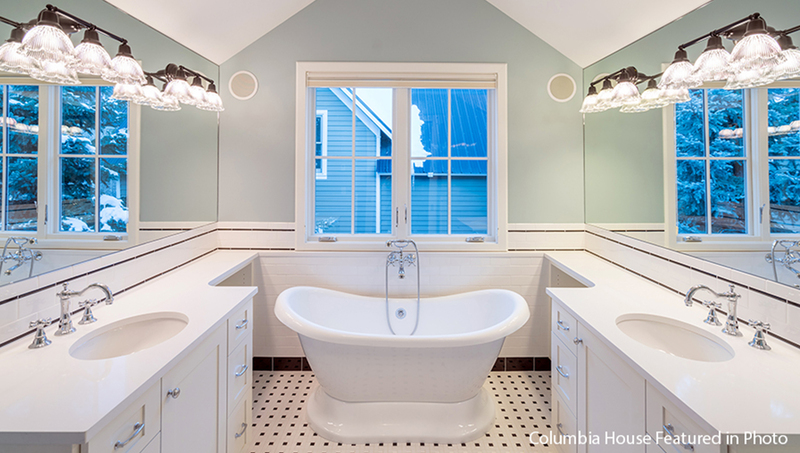 Columbia House is an historic home that underwent a full remodel in 2015, creating a masterpiece in design and utility. With four bedrooms plus a bonus room, five full bathrooms and two separate entertaining areas, this residence will exceed the expectations of seasoned travelers who demand the highest quality in their accommodations. 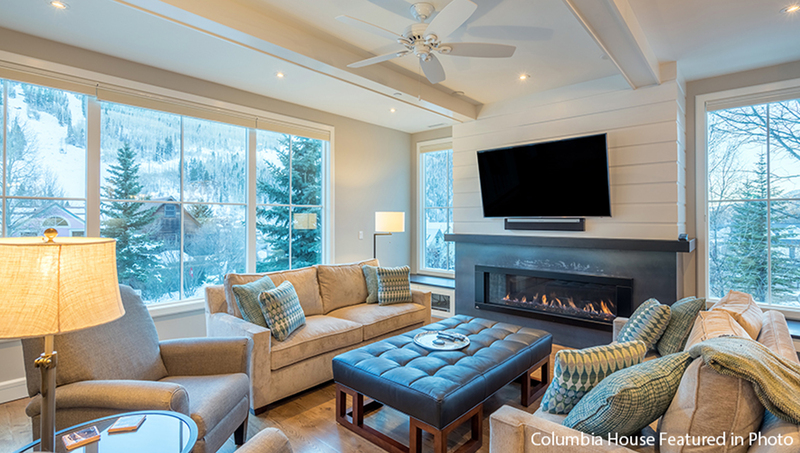 Columbia House is located in the heart of town on West Columbia Avenue, a quiet street in Telluride's Historic Residential District. Entering the home from the wraparound front porch brings you into the recently reimagined Great Room. 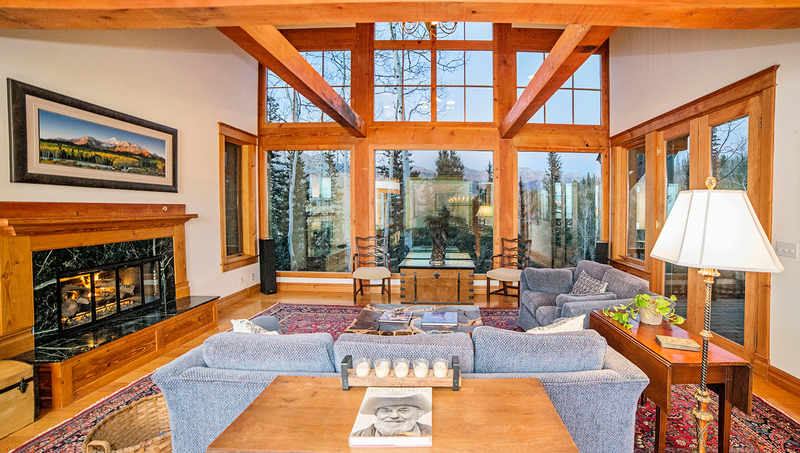 Hardwood floors, a contemporary gas fireplace, a stylish package from Century Furniture and a large flat screen are highlights while the front row views of the mountains fill the massive windows that frame the space. 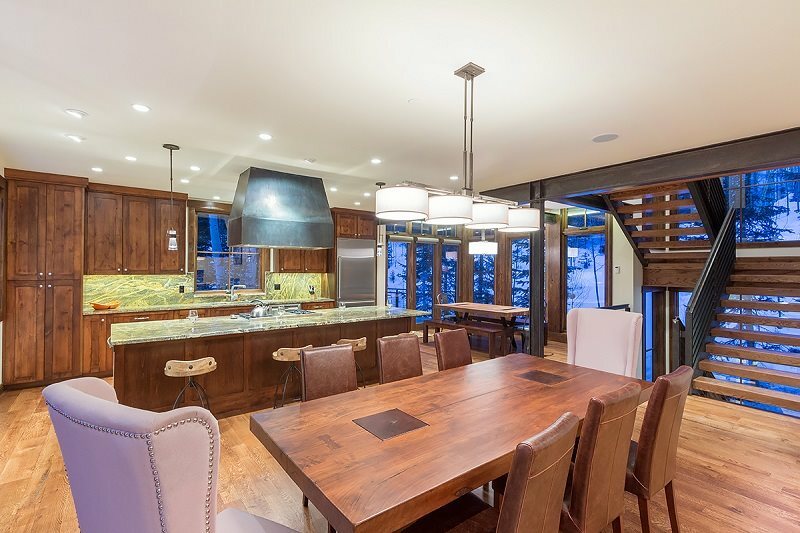 The adjoining dining room and its fabulous table made from reclaimed timbers has seating for 8 while the open kitchen completes the front portion of the main living level. Featuring a country-style sink, expansive counter space and Thermador appliances, this kitchen will meet the expectations of most any chef. Moving toward the back of the home brings you first to the full bathroom with stand up shower that complements the living spaces. This bathroom is attached to the flex room, a peaceful space with a queen sleeper sofa that is the perfect place to get lost in a book. Just beyond the flex room are the sliding doors that lead to the hot tub and its views looking west. The laundry room is also found on this main level. Still moving toward the back of the home, up 6 steps to a small landing, brings you to the bunk room. It contains two sets of bunks (4 extra-long twin beds) with reading lights and the en suite bath contains a shower/tub combo. Back across the landing you will enter the family room, a spacious and welcoming retreat under vaulted ceilings that is furnished with lounge furniture, a wet bar and a flat screen TV. Attached is a bedroom with king bed, flat screen TV and en suite bath with an oversized standup shower. 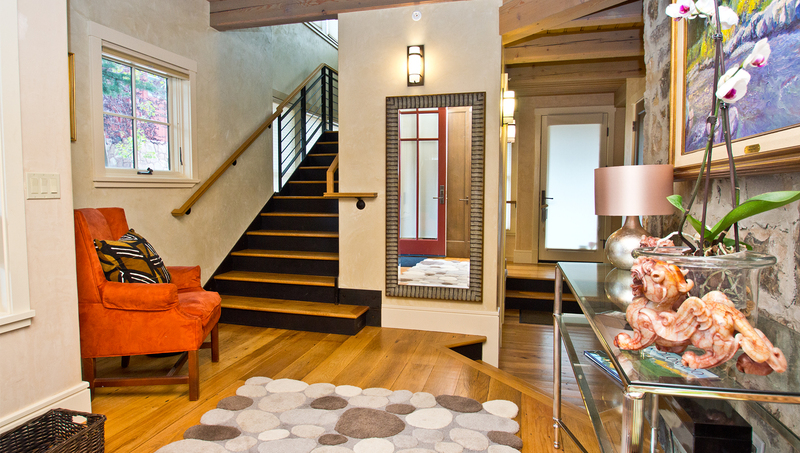 Back down the steps to the main living level brings you to the center staircase with access to the top floor. 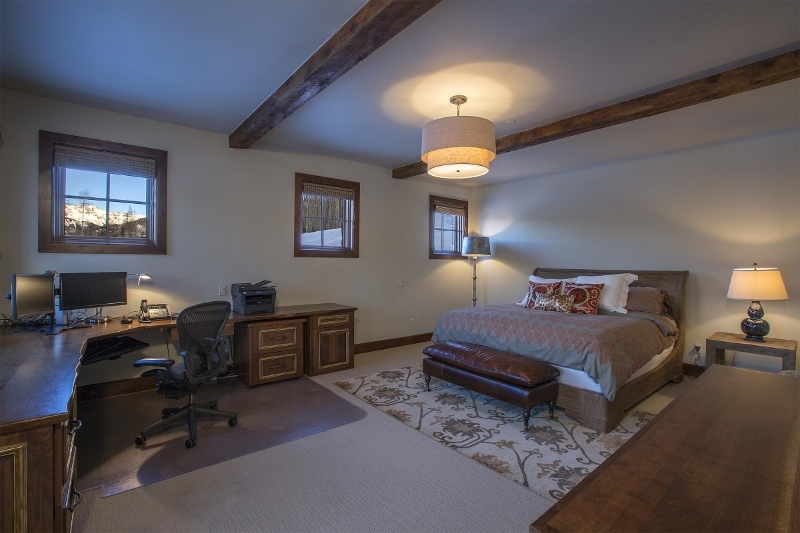 At the top of the steps is another bedroom with king bed, flat screen TV, terrific views looking west down the Telluride valley and a large standup shower in the attached bath. Down the hall is the Master Suite. Inside the door is the walk-in closet and the luxurious Master Bath, highlighted by a soaking tub with views of Ballard Peak. 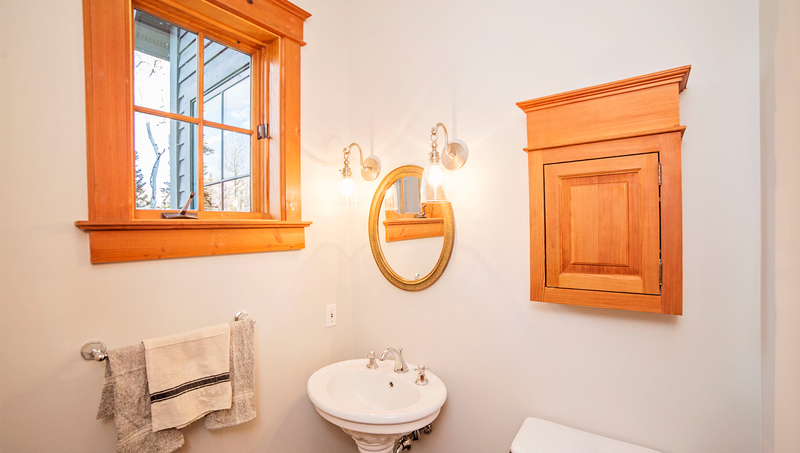 There are double vanity sinks and a steam shower with two shower heads. 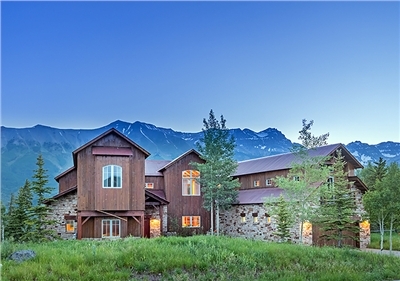 The Master contains a king bed, a flat screen TV and an office space, all under vaulted ceilings with big mountain views. 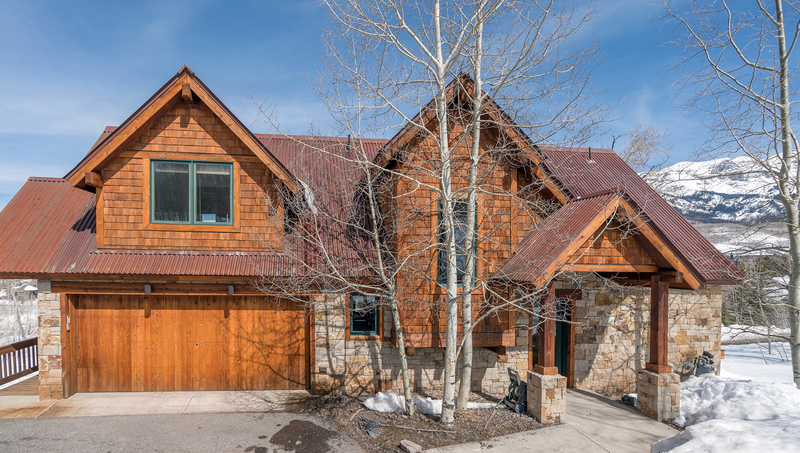 The wraparound front porch, accoutered with a custom barbecue grill and gas-fueled fire pit, affords guests the opportunity to enjoy the stunning mountain vistas as the casual pace of Telluride rolls by. Columbia House has parking for one car in the garage and one car in the driveway. 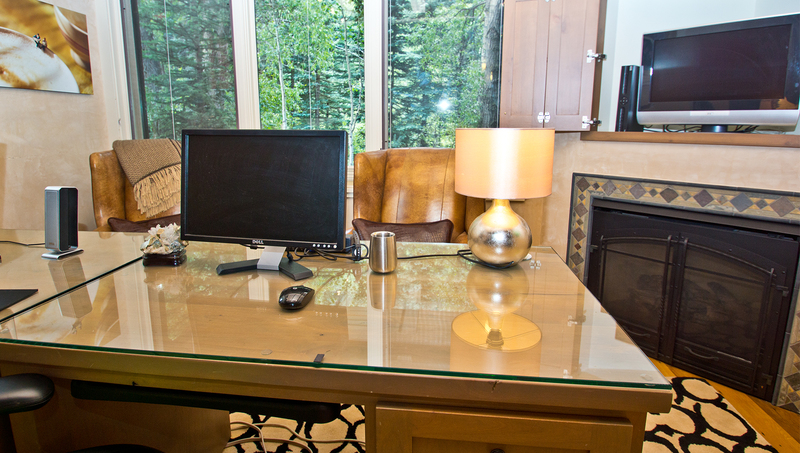 The home is equipped with wireless Internet and cable TV. Bedding: King, Queen, and Three Sets of Bunks (Six Twins). 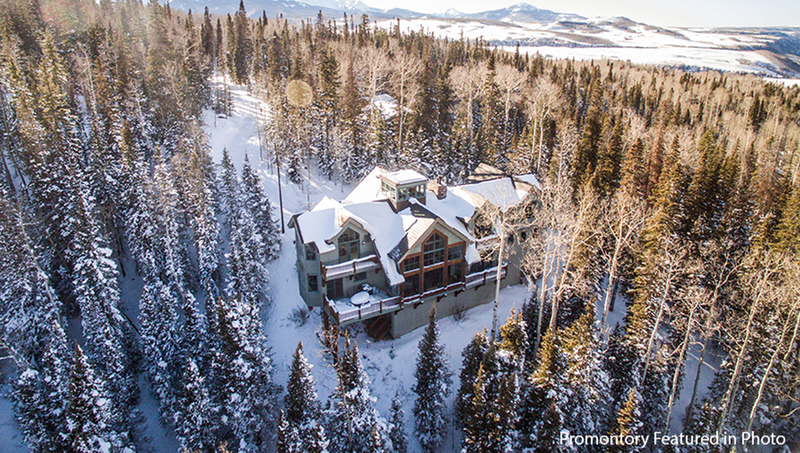 This private home has free wireless Internet access, a ski locker and one designated off-street parking spot. 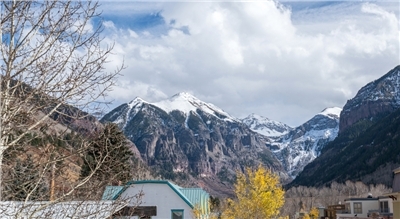 The location is tough to beat - a short walk to Telluride's Main Street (Colorado Avenue) for restaurants and shops and 2 short blocks to the free gondola and lift 8 for easy ski access. 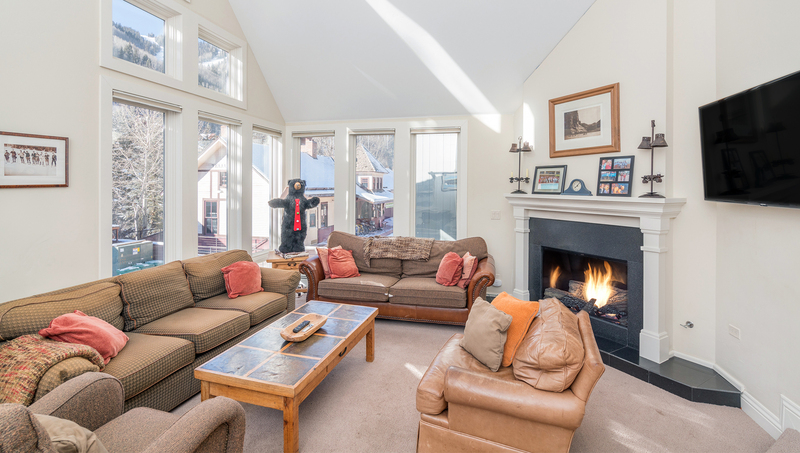 This large Telluride rental home boasts a private hot tub, large deck with BBQ gas grill and spacious living area. 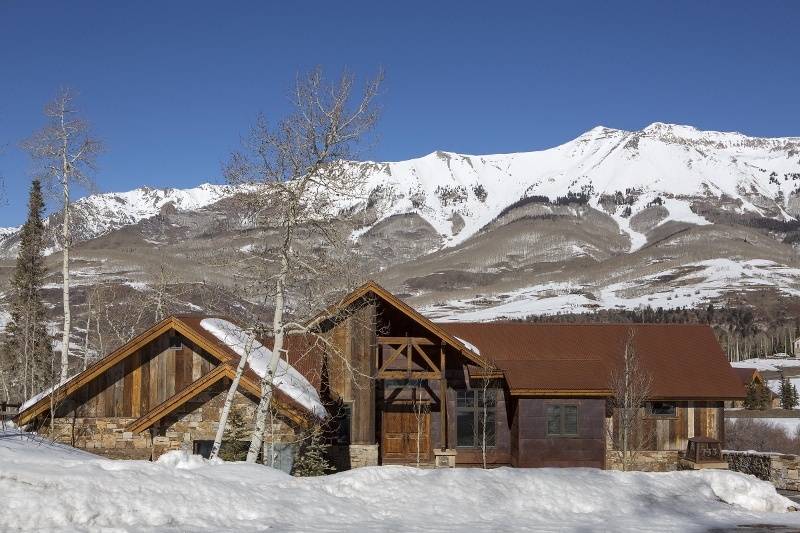 The East End Retreat is an ideal rental home for families and large groups who want the convenience of staying on the East End of Telluride. 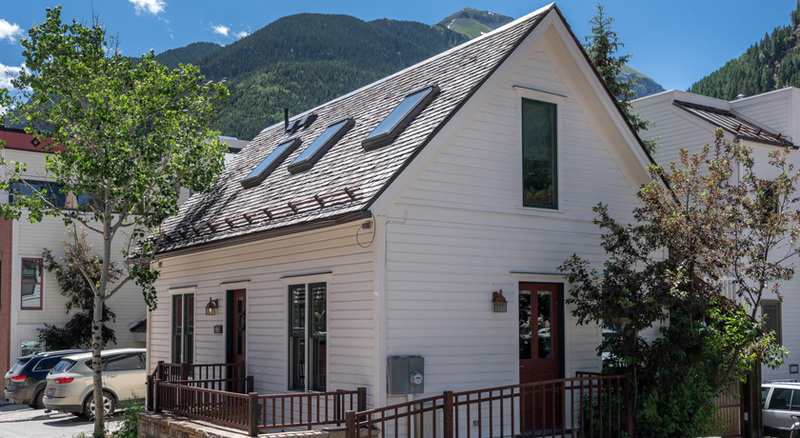 The East End Retreat offers the peace and quiet of Telluride's East End with unobstructed views as it's situated on the end of town. ** Please note that the apartment above the garage and the garage itself are not included in the rental of this home. The home is accessed through the front door, tucked inside a welcoming alcove below the porte-cochere that graces the front of the home. Entering the front door and passing through the convenient mud room brings you to the Great Room, a welcoming space inspired by a Frank Lloyd Wright conversation pit. 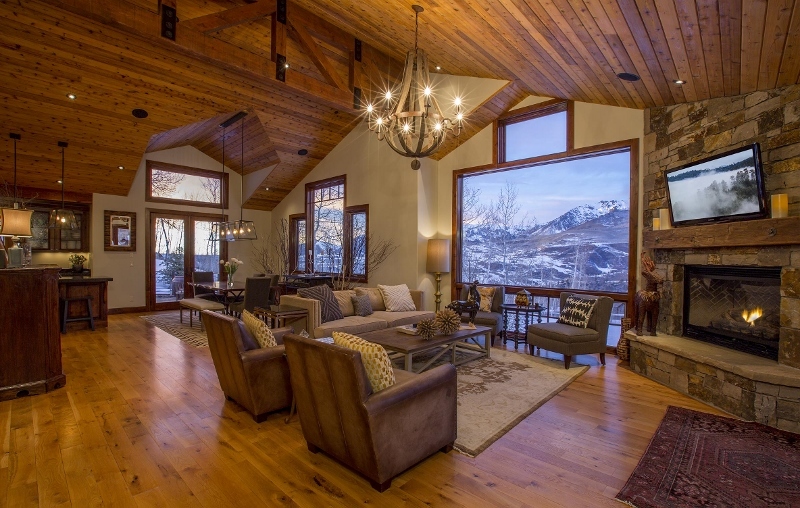 The Great Room has vaulted ceilings and large windows framing the mountain vistas. 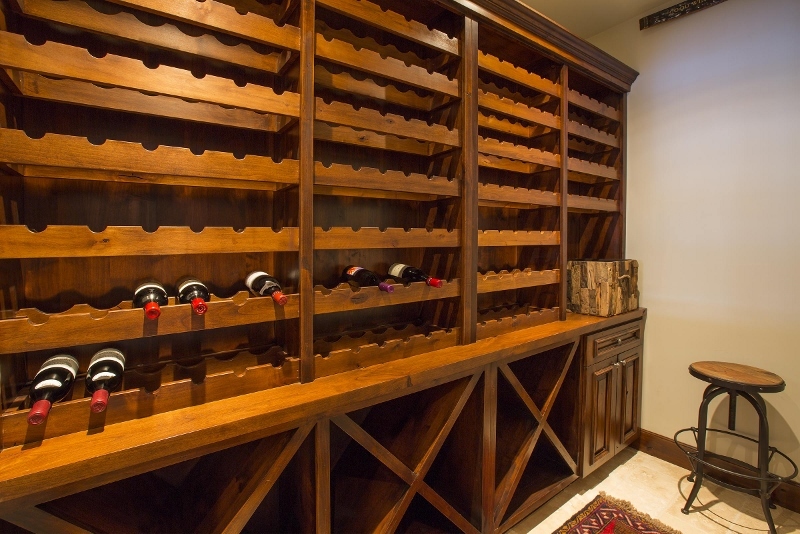 There is a wet bar, a massive gas fireplace adorned in stacked native stone and a plethora of comfortable seating. To the right of the Great Room is the formal Dining Room with seating for 10. Adjacent to the dining room is the openly designed kitchen, with stainless steel appliances, granite countertops and ample storage. The open floor plan extends beyond the kitchen to the media room, with large flat screen TV and seating for the entire group. There is a separate guesthouse above the garage occupied by a caretaker that shares no access with nor to the main home. â€¢ Suburban for guests use provided. â€¢ Free Dial A Ride â€“ 970-728-8888 available to guests â€“ "On Demand" shuttles 7 a.m. â€“ Midnight! 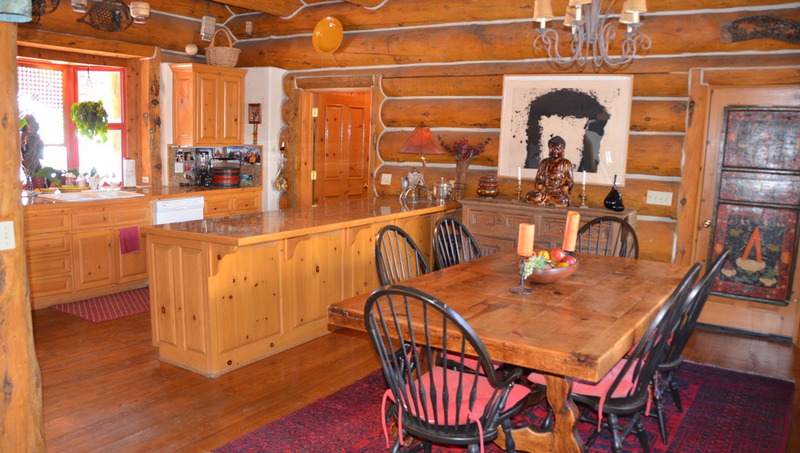 Family-style log home in Mountain Village with plenty of privacy. Bedding: Queen bed, Double bed, 2 twin beds, Queen sleeper sofa. 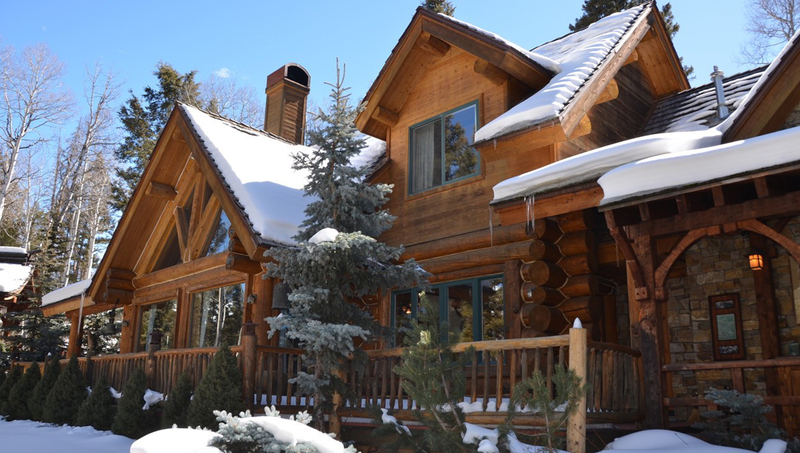 Walk into this imperial-style log home through the main entrance facing Adams Ranch Road. Enter into the foyer and open living room with plenty of closet space and open sitting area with a gas fireplace overlooking the peaceful back yard. 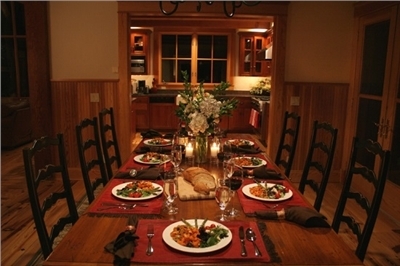 Adjacent to the living room is a dining table for 6 guests and large family kitchen. The kitchen further connects to the laundry room and 2-car garage. Next to the living room on the main level is a private den with flat screen TV and DVD, queen sleeper sofa, desk, half bath as well as a separate room the owners have used as a meditation room. Upstairs you will find the 3 bedrooms. 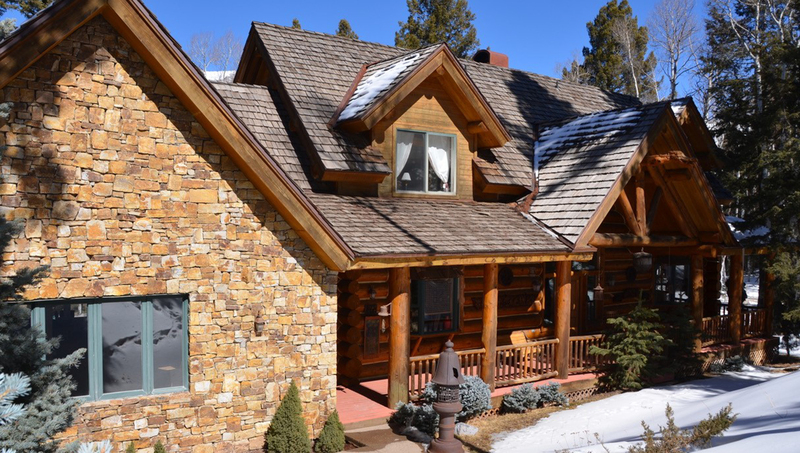 On the east side of the home is the master bedroom with a queen bed, bathroom with shower and a private deck with amazing mountain views. Across the walkway on the west side are 2 bedrooms adjacent to each other. These bedrooms share a bathroom in the hallway with a shower/tub combo. One bedroom has a double bed and the other has 2 twin beds. 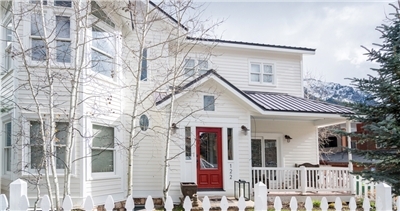 This home features a peaceful backyard and is situated above the Jurassic mountain bike trail in Mountain Village. 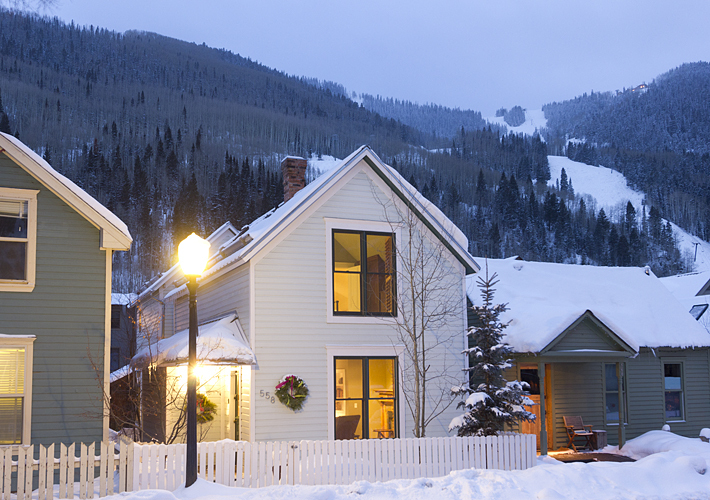 Skiing, golfing, hiking and restaurants are a short drive from the home. 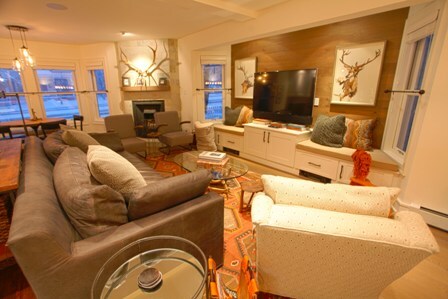 Three levels of incredible luxury, designer furnishings, antiques, and custom art. Every bedroom has an en suite bath. 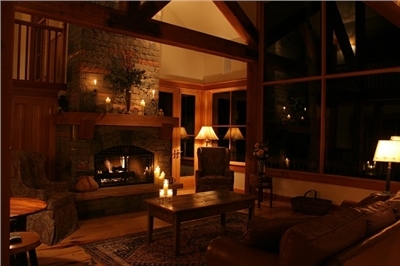 Wood burning fireplace in living room with floor to ceiling stone work, 3 additional gas fireplaces in the home. 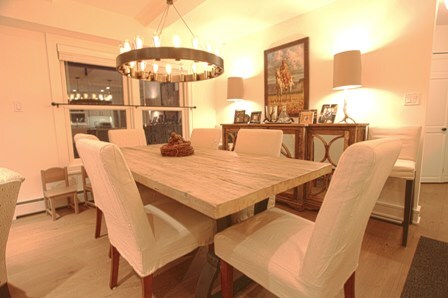 Gorgeous custom steel dining table with seating for 8-10 - the table was custom made in Belguim and crafted from a old ship. High end stainless steel appliances including a commercial grade range with 8 burners, built in grill, and double ovens. Full service apartment with kitchen, bath, and sleeping area. The bedding in the home includes one king bed, one queen bed, two sets of twin bunk beds, and two twin beds. You enter the Legacy Home from Depot Ave into an entryway and hallway. To the right of the entryway, there is a bedroom with a queen bed, flat screen TV, bay window and attached bath with a soaking tub and shower. The next room down the hall is a bathroom with a shower only. Across the hall from the bathroom, there is a second bedroom with two built in twin bunk beds. At the end of the hallway, there is a third bedroom with two twin beds, TV, DVD player, and attached bath with a shower only. Next to this bedroom is a door leading to a one car carport. A staircase is just to the right of the entryway; on the second level of the home there is a grand room that includes a dining room table that can seat 8, spacious living room, and fully equipped kitchen. 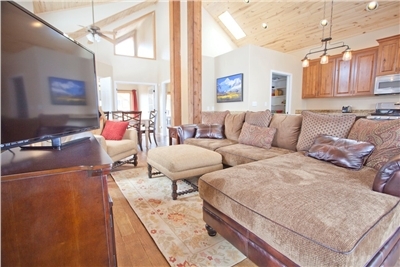 The living room has two TV's, DVD and VHS player, a gas fireplace, game table, and deck with views to the south. 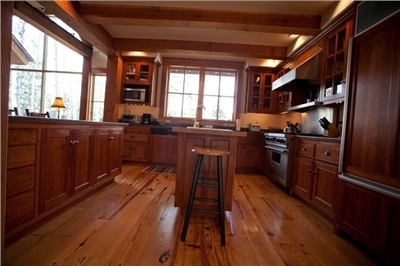 The kitchen is fully equipped and has a six burner viking gas stove, granite tile counter tops, hardwood floors, and three bar stools under the island. 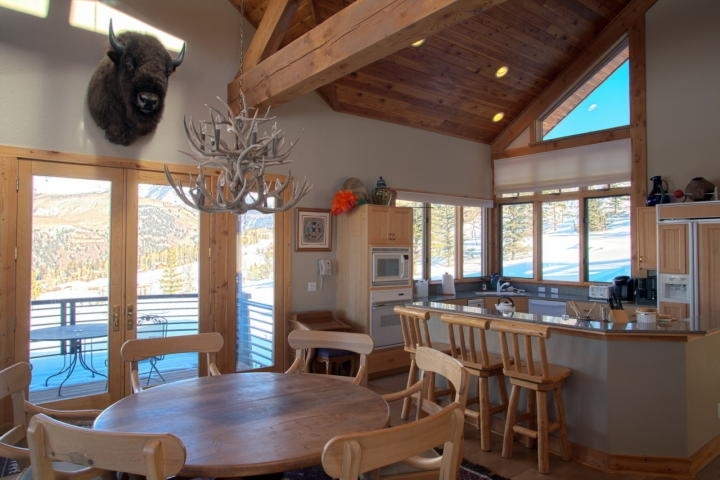 Just beyond the kitchen there is a second deck with a private hot tub, BBQ grill and views of the mountains to the north. A half bath and washer/dryer are also located on this level. 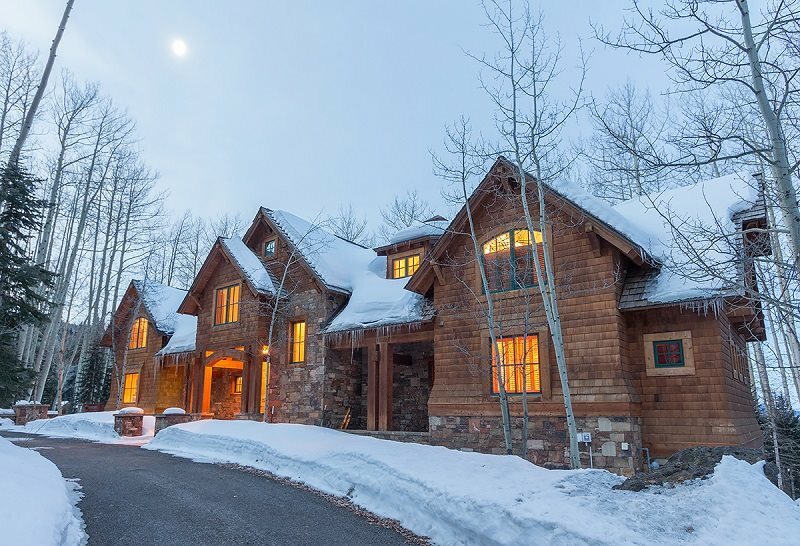 Right on the golf course, this 4-bedroom home on Russell Drive in Mountain Village has outstanding views of the Sneffels Range and sunsets in the western sky. Bedding: King, Queen, Queen and bunk bed, Queen, Queen futon (loft area), queen sleeper sofa (living room). Pet-friendly home. You enter this home into the great room. The living room is in front of you and the kitchen and dining room are to your right. 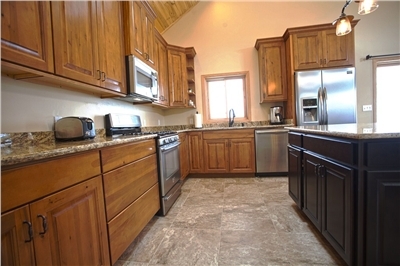 The kitchen has granite tile counter tops, updated appliances and is open to the dining room. The dining room has seating for 6, and there are doors off the dining room that take you out on the deck with a private hot tub and gas grill. The living room has leather furniture, a queen sofa sleeper, flat screen TV, gas fireplace, vaulted ceilings and views on to holes 10 and 11 of the golf course. Above the living room is an open loft area with a queen futon. Upstairs from the living room is the master bedroom with a king bed. The master suite includes a walk in closet, TV and private bath with double sinks a jetted tub and shower. Downstairs from the living room are the rest of the bedrooms. The second bedroom has a queen bed and flat screen TV. There is a private bathroom with shower/tub combo. Down the hall is the 3rd bedroom with a queen bed and bunk bed, flat screen TV and private bath with shower tub combo. The last bedroom has a queen bed and futon and TV. This room also has a private bathroom with a shower tub combo. Featuring two master suites, a guest bedroom and a bunk room with four twin beds, the house can accommodate up to 10 guests. Entering the home on the ground floor brings you into the Great Room, an inviting space with a gas fireplace, overstuffed furniture, a 75 inch flat screen TV and sound system, vaulted ceilings and mountain views outside the two story windows. The attached dining room can accommodate everyone in your group and the open kitchen is replete with every tool a discerning chef might desire. 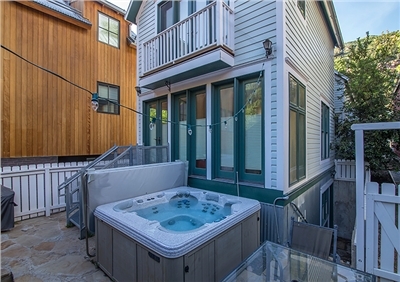 This level provides access to the expansive deck on the west side of the home which features plenty of furniture, a gas grill and an inviting hot tub. There is a half bath off of the Great Room for convenience. 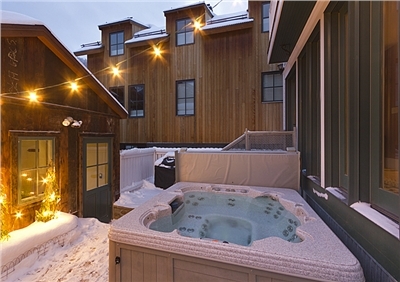 Completing the ground floor of the Slopeside Lodge is the guest master, featuring a king bed, a steam shower, flat screen TV and direct access to the hot tub deck. The top floor of the home is occupied by the master suite. 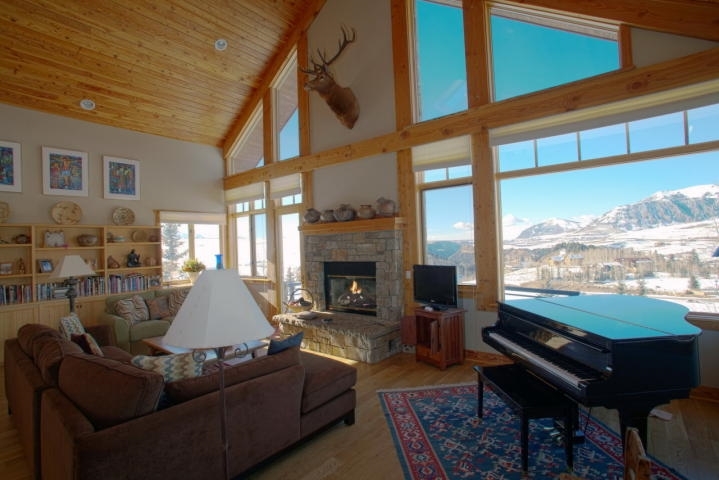 It features a king bed, a flat screen TV and a private balcony with views of Palmyra Peak. The en suite bath has a jetted tub and an oversize steam shower. The lowest level of the home contains the comfortable family room with gas fireplace, flat screen TV and a plethora of movies and games. The kids' room with two twin bunk beds and the third bedroom with a king bed share the bathroom on this lower level that has a shower/tub combo and an extra sink/vanity inside the third bedroom. 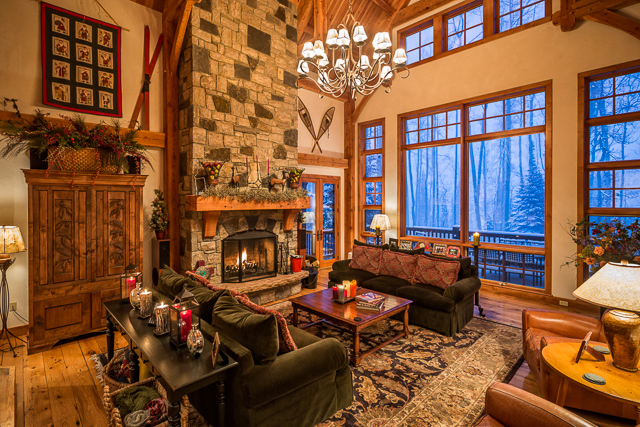 The door to the backyard in the family room is the ski door, with a ski rack, space for your winter gear and seamless ski access to the Village Bypass ski trail. 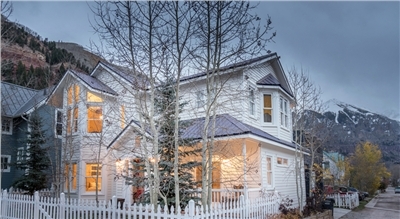 Enter this classic Telluride residence from Spruce Street, through the white picket fence gate and the burgundy door. 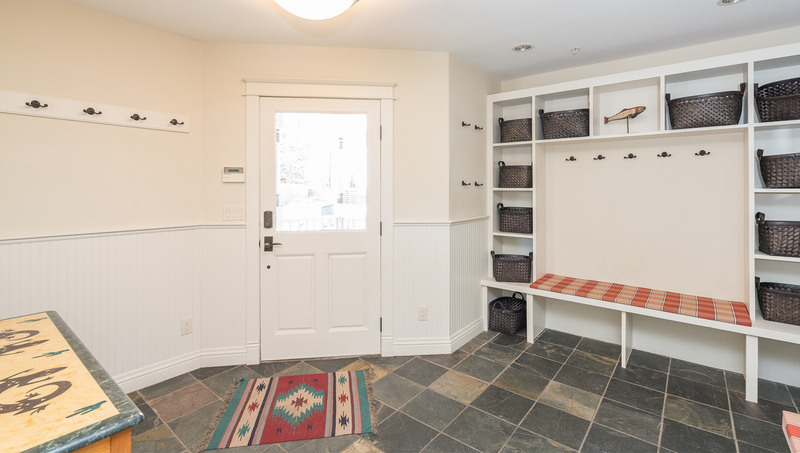 And entry mud room provides hooks for your coats and space for your shoes and boots. The mud room leads to the entry hall with a coat closet and the location of three of the four bedrooms. On your right is the junior master suite, with a queen bed, a flat screen TV, a private deck with seating for two, and an en suite bath featuring a claw-foot tub with shower. Back into the entry hallway leads to the second and third bedrooms, both furnished with king beds, large closets, and flat screen TVs. These two large bedrooms share a hallway bathroom with a standup shower. Back in the hallway you will find the laundry room and the back door that leads to the two off-street parking spaces that are accessed from the adjoining alley. Heading back toward the front toward leads to the staircase and the top floor. 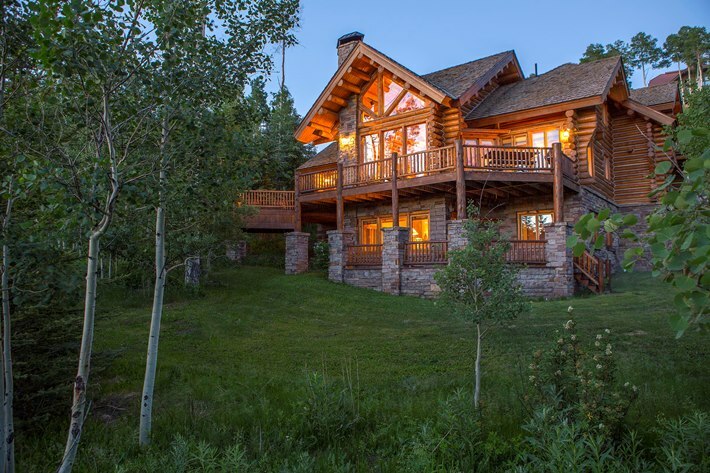 On the right at the top of the steps is the considerable Master Suite, featuring a king bed, a large flat screen TV, comfortable chairs and access to the primary deck that enjoys eye-popping views of Ajax Peak and the Telluride Box Canyon. 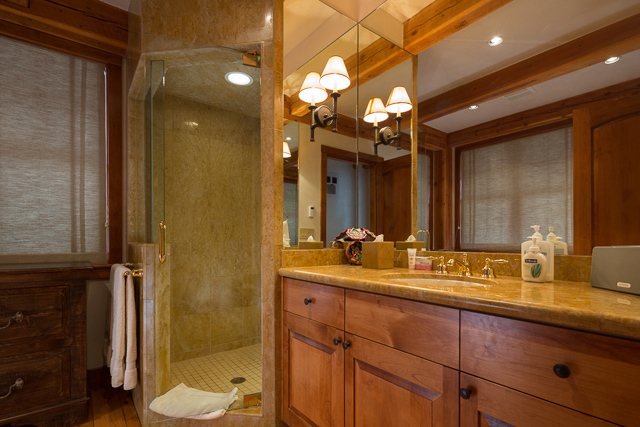 The en suite bath features double vanity sinks and a roomy standup shower with two shower heads. Outside the Master are the home's living spaces, laid out openly under vaulted ceilings form the front of the home to the back. Above Spruce Street is the dining room with seating for seven plus two stools at the kitchen bar. The kitchen provides ample counter space and storage and is equipped with everything you will need to enjoy fine meals at home. 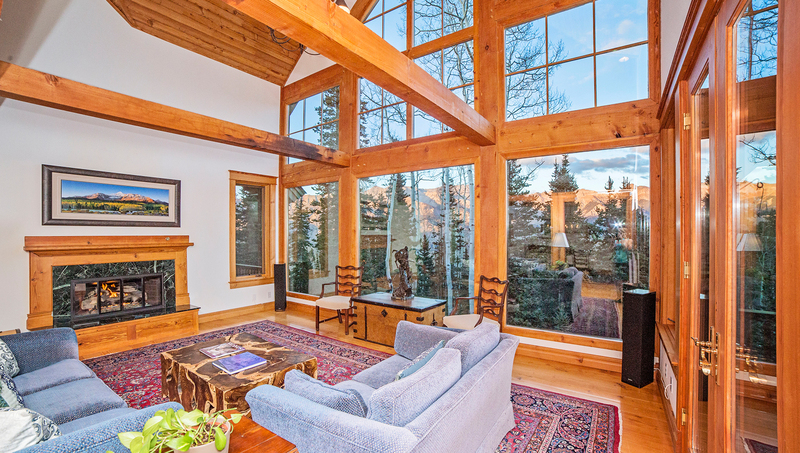 The Great Room is a light-filled space behind two-story windows that are filled with mountain views. There is an entertainment system with a large TV and a pleasant gas fireplace in front of two large, soft couches. The living space is further expanded onto the adjoining deck with abundant seating and a gas grill. 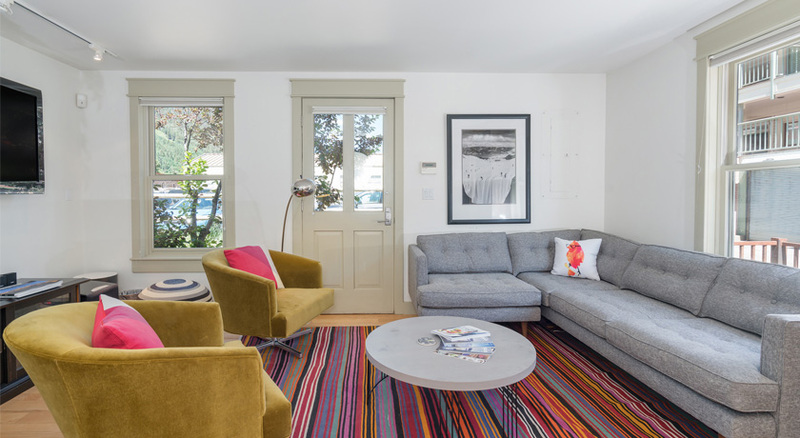 The home is one-half-block off Main Street above the Spruce Street Park, home to the locals' favorite farmers' market on Saturdays in the summer, and The Butcher and The Baker restaurant, source of the best breakfast burrito in town and many other scrumptious selections. The home is equipped with wireless Internet and can accommodate two cars parked off the street. 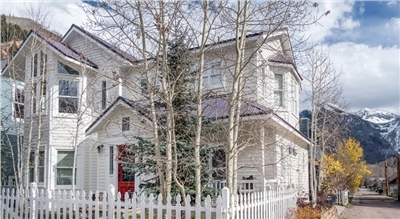 The Tavern Home sits conveniently in the corner of West Pacific Avenue and Davis Street in the historic district of Telluride. The Tavern House was historically a popular bar called West End Tavern, and before that Liemgruebers, imbuing the atmosphere with decades of merriment. Bedding: King bed, king bed, queen bed, 2 twin beds, twin bunk bed. 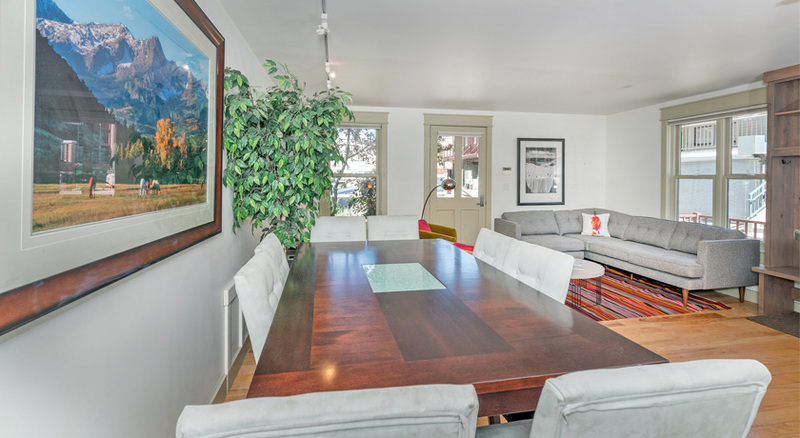 This home has, per Telluride guidelines, been preserved to keep Telluride's rich history while providing a luxurious accommodation inside. Entering from the front porch, step into the great room that has been magically transformed. On this main level is a large kitchen with Thermador and Kitchenaid stainless steel appliances and granite counter tops. There is a large bar (keeping the historic West End Tavern theme) with seating for six and large flat screen TV. Open to this area is also a dining table with seating for four and a sitting area with an L-shaped couch, gas fireplace and large flat screen TV. If you walk into this home through the back door, you enter into a spacious mudroom with plenty of storage space for coats and shoes, including several boot dryers. To the left is a small bedroom with a pocket door. The room has a twin bunk bed, small flat screen TV and gas fireplace. This bedroom has access to a full bathroom in the hallway with shower. Downstairs is a comfortable sitting area with large flat screen TV, gas fireplace and wet bar. There is also a laundry room on this level with LG washer and dryer. There are three bedrooms on this level. The second master has a king bed flat screen TV and adjacent bath with double sinks and shower/tub. The bedroom adjacent to this has two twin beds and flat screen TV. The 3rd bedroom on this level has a queen bed, flat screen TV and bathroom with shower. There is also a small back patio on this level with a BBQ grill. Upstairs is the master suite. It has a king bed and large flat screen TV as well as a private balcony with a small hot tub. The seating area for two has a gas fireplace and plenty of closet space. 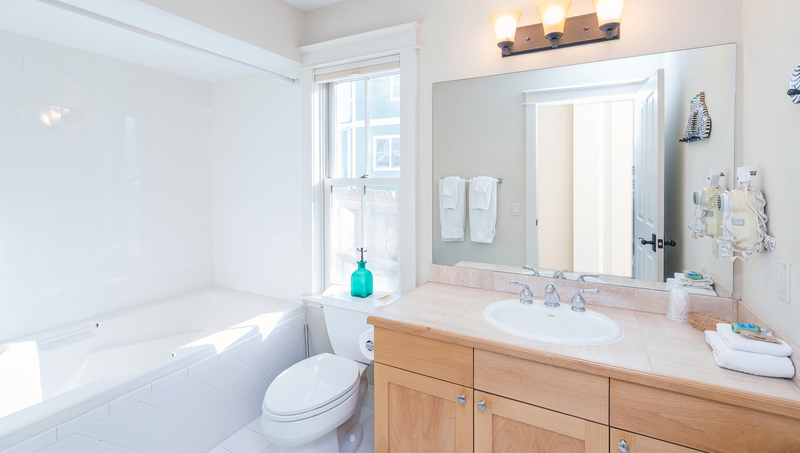 The master bath has double sinks, jetted tub and steam shower as well as a small balcony. 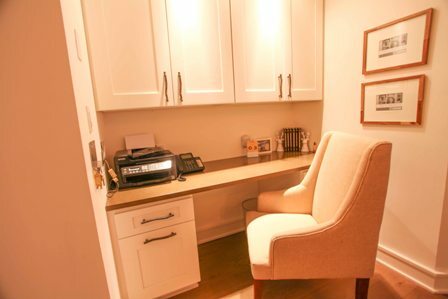 There is also a desk area with room for a laptop. The home enjoys private garage parking and complimentary wifi. 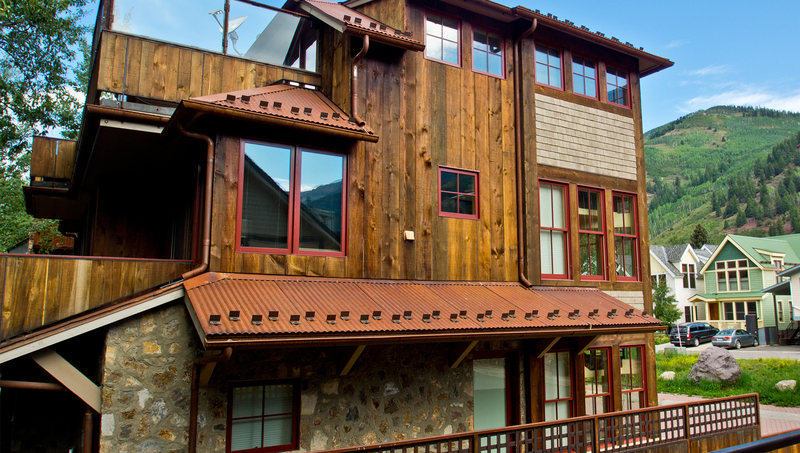 The ski lifts are two blocks in either direction, and the historic downtown is a 10-minute walk away. The free in-town shuttle stops on the corner. And if you come for Film Festival - you'll be midway between the Palm & Pierre and the Opera House & Nugget. 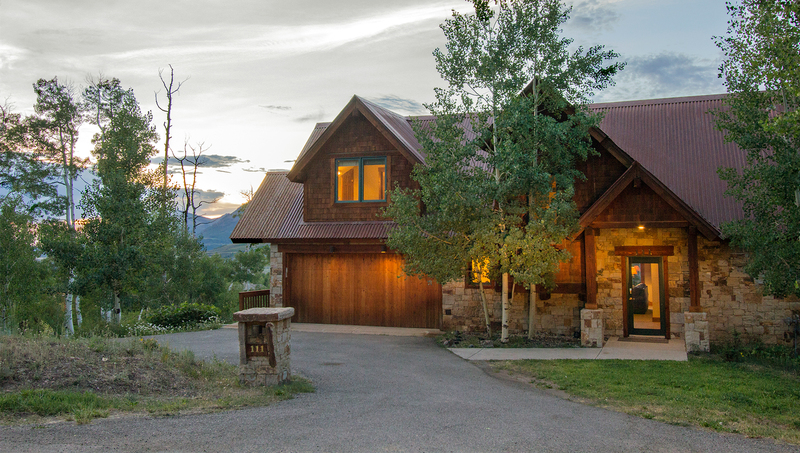 The Promontory is a well-appointment four-bedroom stone and wood beam mountain home situated among the high alpine spruce and aspen groves in the Ski Ranches neighborhood. 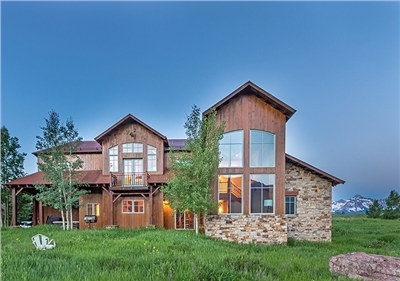 Convenient to Telluride and Mountain Village, this quality built custom home boasts big mountain views of the San Sophia Ridge and the Sneffels Range with terrific privacy adjacent to the National Forest from a cul-de-sac location. Bedding: King, Queen, Twin and Trundle, Bunk bed. 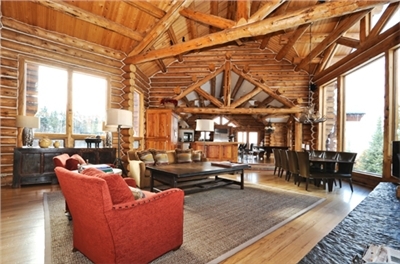 Upon entering through the front door to the home the large living area welcomes you. 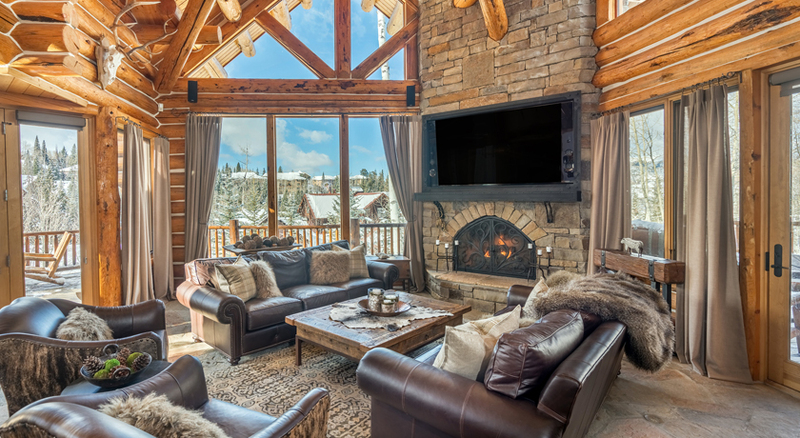 A large gas fireplace greets guests along with two large comfortable couches, a balcony, and stunning vistas to the north. To the right side of the entry hall is the dining area with seating for eight and a small deck. Further to the right of the dining and living areas are the kitchen and breakfast nook with seating for four. Stunning San Sophia views are visible from the kitchen, breakfast nook and balcony to the north of these combined areas. The opposite end of the main level houses the den, powder room, and access to the two-car garage. 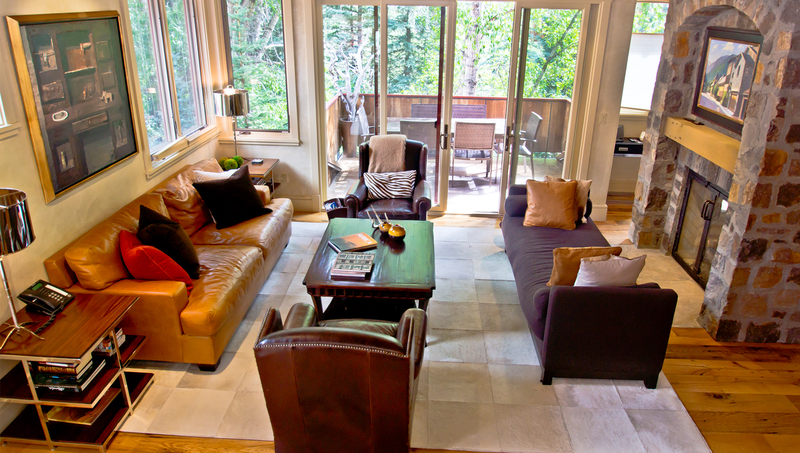 The den is equipped with a comfortable sofa, a large flat screen TV, a gas fireplace and a private balcony. A powder room down the hall from the den serves the main level living areas. Continuing down the hall you will find the laundry room and access to the two-car garage. Upstairs is a landing overlooking the living area and providing access to all bedrooms and an observation tower seating area. 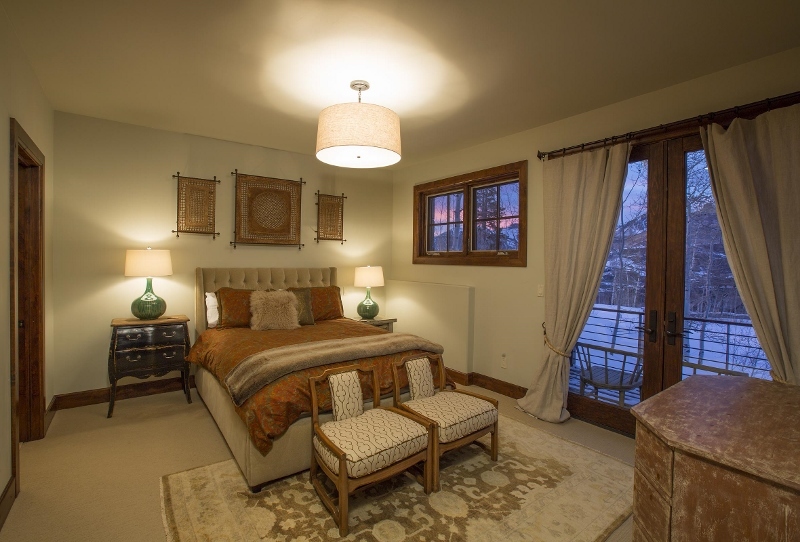 The master bedroom has a king bed, private balcony, vaulted ceilings, impressive mountain views, and en-suite bathroom with a jetted tub and steam shower. 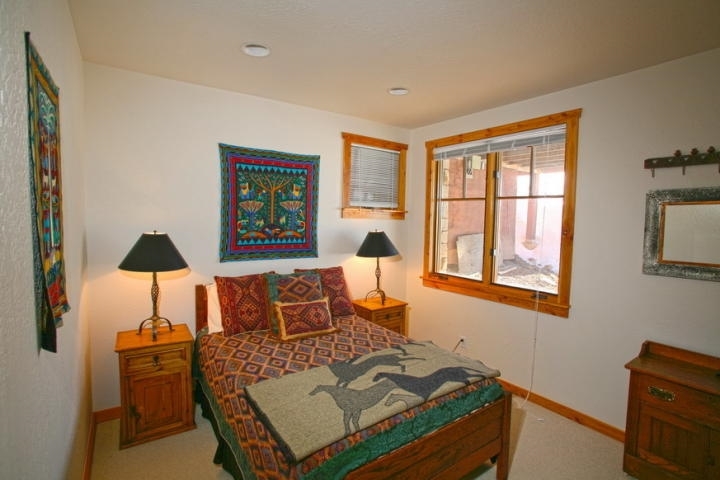 The second bedroom has a queen bed, vaulted ceilings, and a private balcony. 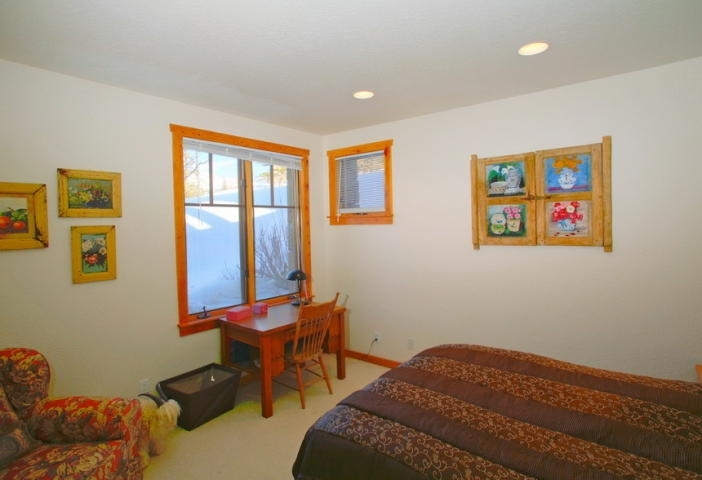 The bunkroom on this level is equipped with king, queen, and twin beds, vaulted ceilings. A full bathroom on this level services the queen and bunk bedrooms. 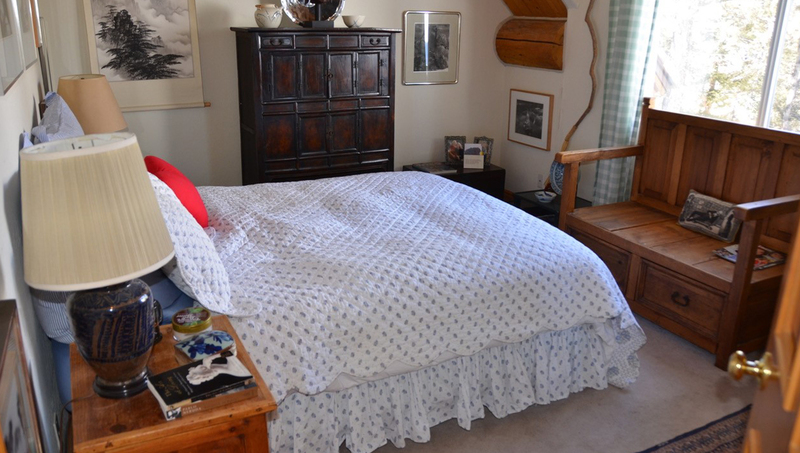 The final bedroom has a twin daybed with a twin trundle, vaulted ceilings, and en-suite bathroom with shower only. From the second level landing, the guest can access the observation tower seating area via the antique metal spiraled staircase. Enjoy the sunrise, sunset, and everything between with 360-degree views of the San Juan Mountains from the prominent seating area. 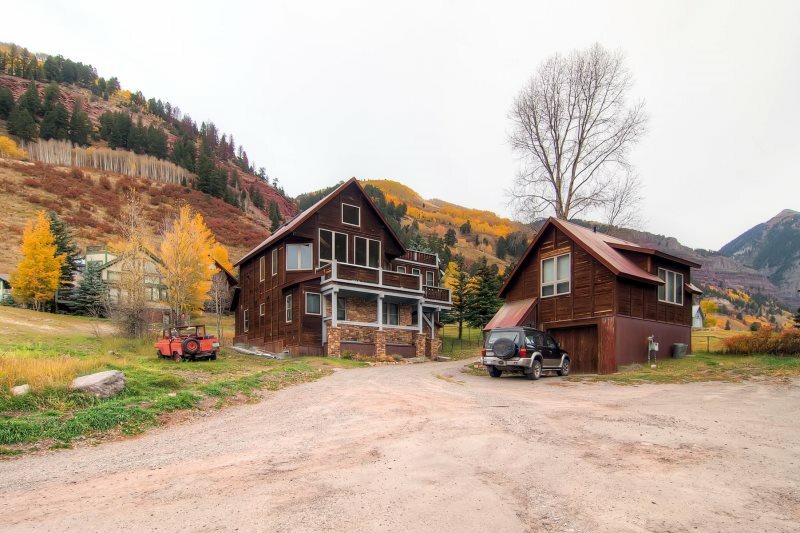 Surrounded by Uncompahgre National Forest, the property feels private and remote yet has the benefits of the Ski Ranch community and is convenient to the Mountain Village and downtown Telluride. 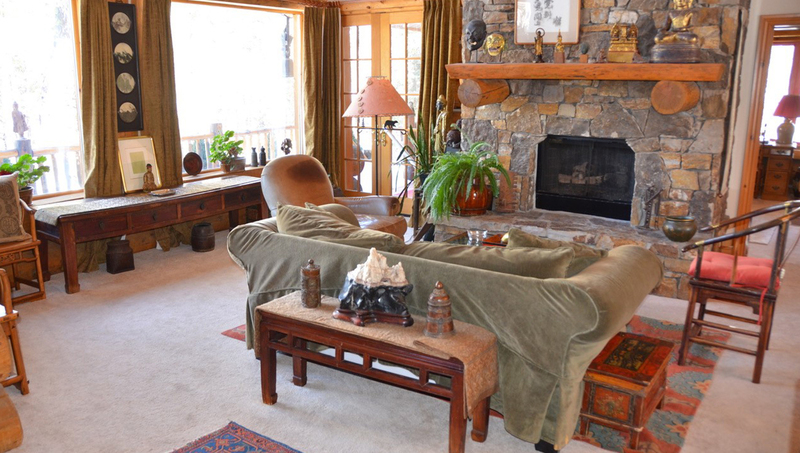 A short drive or taxi ride will deliver you to Mountain Village for ski access in the winter. Summer hiking trails are conveniently found steps from the backdoor and connect with surrounding trails in the area. Bedding: king bed, king bed, queen bed, queen bed, queen bed, captain's bunk bed (double/twin). 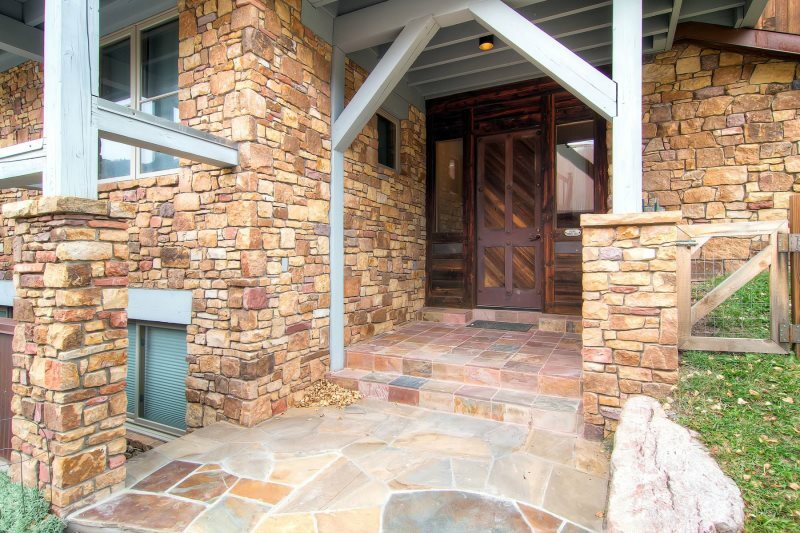 Enter this beautiful 4-level property via W. Depot Avenue (#510). Walk into an entrance hall with coat rack, straight ahead from the entrance is a bedroom with a king bed, large flat screen TV, gas fireplace, walk-in closet and ensuite bathroom with steam shower, jetted tub and double sinks. Also on this level is a half bath in the hallway, exit to the carport with room for 2 cars and an office with 2 computer stations, gas fireplace and wet bar. 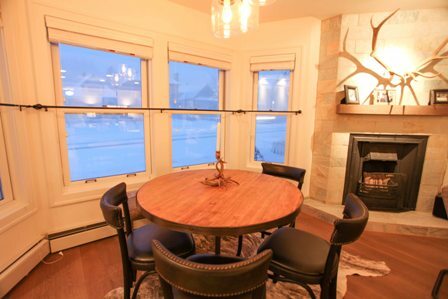 Upstairs one level is the living room with leather furniture, wet bar and access to a heated deck overlooking the river with dining seating for 6 guests. There is also a double-sided gas fireplace that also faces the dining area with seating for 6 indoors. 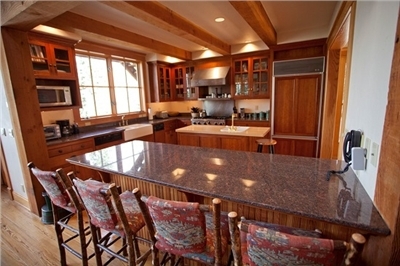 The kitchen on this level has granite countertops, copper sink and Viking appliances. From here, there is another heated deck facing the river with seating for 5 and a BBQ grill. Also on this level is a laundry room and a bedroom with a queen bed, flat screen TV and separate bath with shower/tub combo. The master suite is located on the top and 4th level with a sofa facing towards the river and mountains as you walk upstairs. 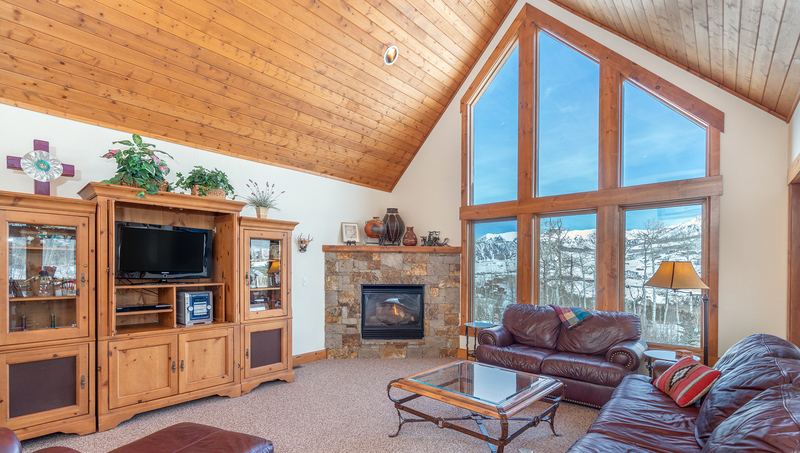 The master bedroom has a king bed, walk-in closet, flat screen TV and gas fireplace and a heated deck overlooking the river and ski mountain with lounge seating and an outdoor hot tub. There is an ensuite bath with shower, jetted tub and double sinks. On the bottom floor is the media room with flat screen TV, projector screen, wine fridge, wet bar, gas fireplace and lounge seating - a perfect place for the kids to gather or the entire family to hang out. This level also has 3 bedrooms. The first bedroom has a queen bed, flat screen TV, Xbox 360, separate bath with shower only and a walkway to the outside and adjacent river trail. The 2nd bedroom on the bottom floor has a queen bed, flat screen TV and a separate bath in the hallway with shower/tub combo. The 3rd bedroom has a captain's bunk bed (double/twin bunk bed) and flat screen TV. 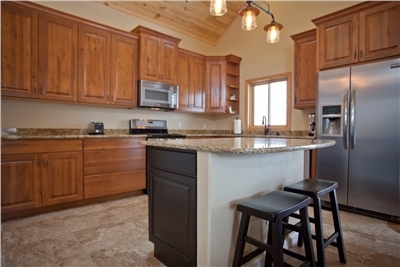 There is also a full kitchen on this level with Viking appliances and a walkway to the river trail. This lovely home has free wireless Internet access and parking for 2 vehicles in the carport. 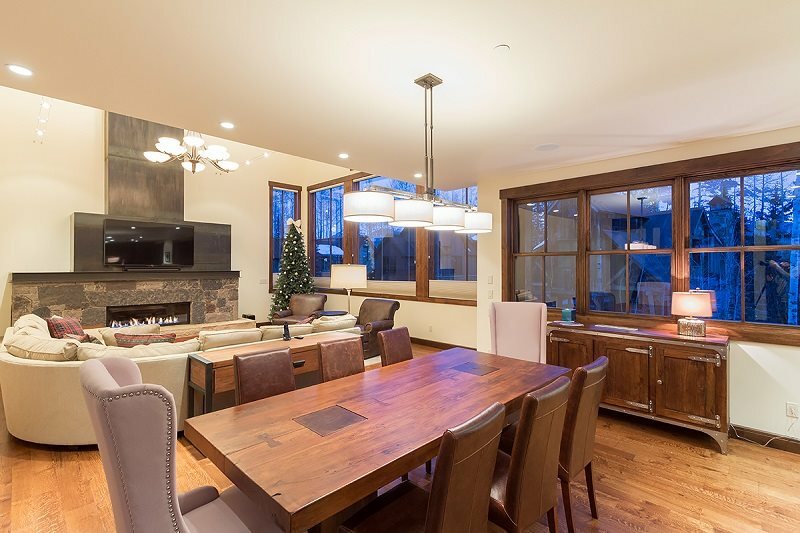 A luxurious 4-bedroom home in Historic Telluride's Depot District. Riverside location just 1.5 short blocks from the Gondola. 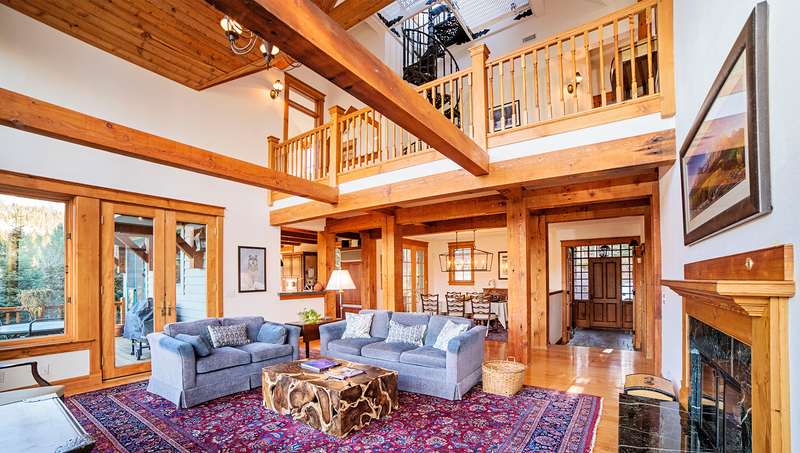 Upstairs one level is the living room with a custom furniture package, wet bar and access to a heated deck overlooking the river with dining seating for 6 guests. 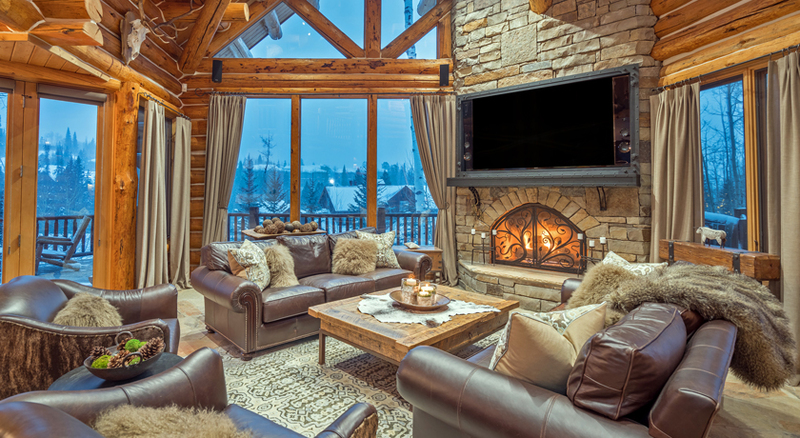 A double-sided gas fireplace of native stacked stone frames one side of the living room, separating it from the elegant dining room with seating for 6. 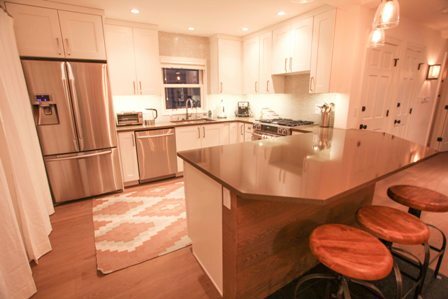 The gourmet kitchen also occupies this level, with granite countertops, a country style copper sink and appliances fit for the most discerning chef. 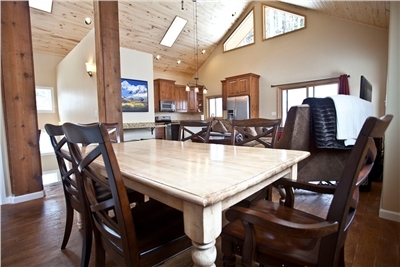 Off the kitchen is a second heated deck overlooking the river with a gas grill and seating for 5. Completing this main level of the home is a laundry room and a guest bedroom with a queen bed, flat screen TV and a separate bath with shower/tub combo. One level up to the top floor brings you to the Master Suite. 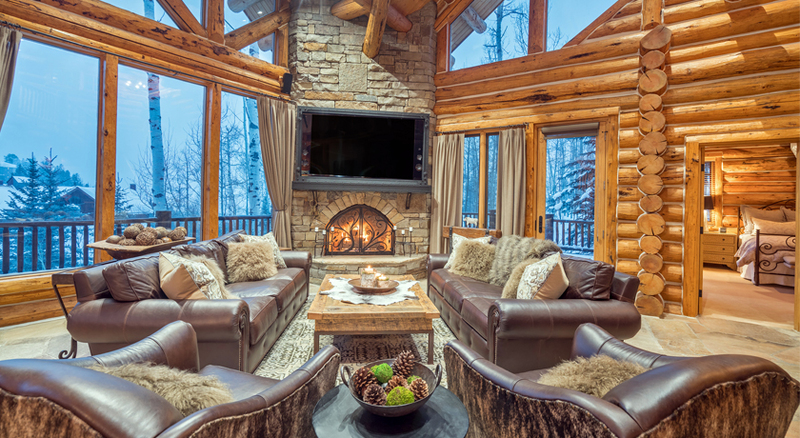 You first enter the lounge area, with comfortable leather furniture, stunning views of the Telluride Box Canyon and access to a heated deck with a large hot tub. 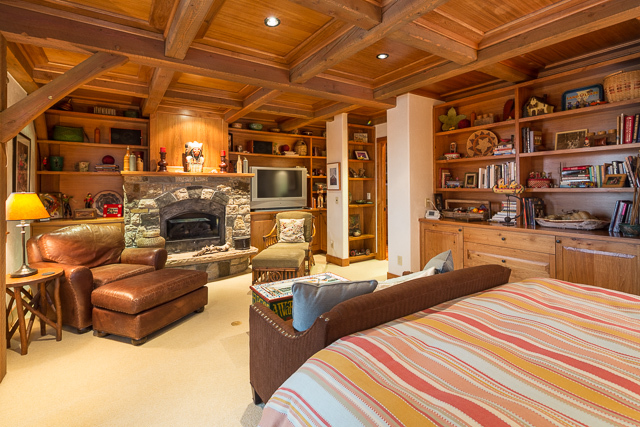 The master bedroom has a king bed, walk-in closet, flat screen TV and gas fireplace. 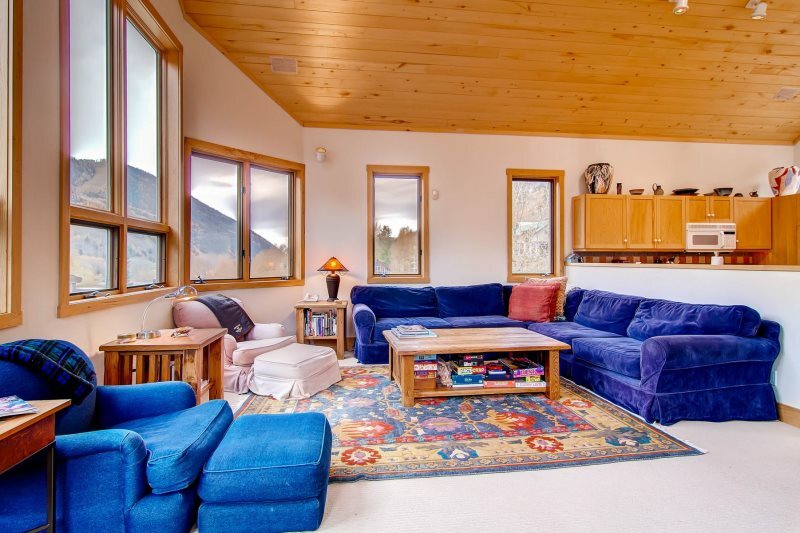 The upper heated deck can be accessed from this side of the Master Suite as well, with lounge seating from which to take in the mountain views while you listen to the sounds of the river below. 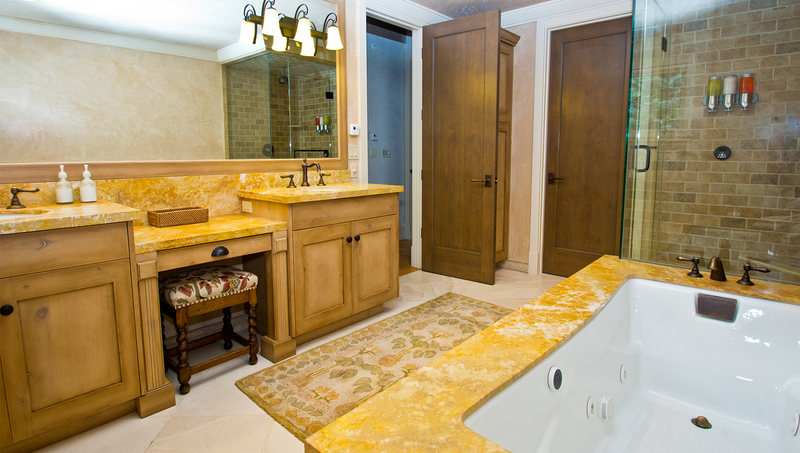 The luxurious Master Bath features a steam shower, a large jetted tub and double sinks. On the bottom floor of the home is the media room with flat screen TV, projector screen, wine fridge, wet bar, gas fireplace and lounge seating - a perfect place for the kids to gather or the entire family to enjoy movie night together. This level also holds the second guest bedroom with a queen bed, flat screen TV, XBox 360, separate bath with shower and an egress to the garden level patio adjacent to the river trail. This lovely home has free wireless Internet access and parking for 2 vehicles. 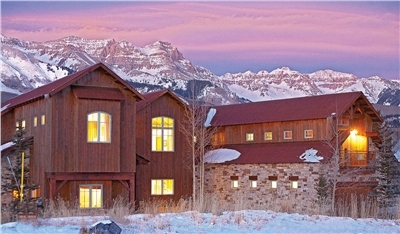 With a finish level that will satisfy the most discerning travelers, travelers seeking the finest accommodations in Telluride will find their match at the Riverfront Estate. 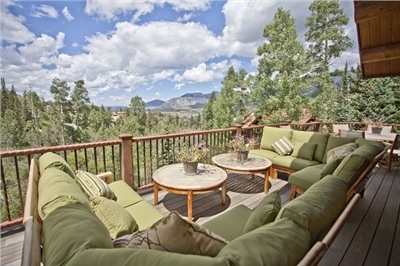 Vista House - Located in the Adams Ranch Neighborhood in Mountain Village, Fabulous Private 4-Bed Home with Stunning Views. 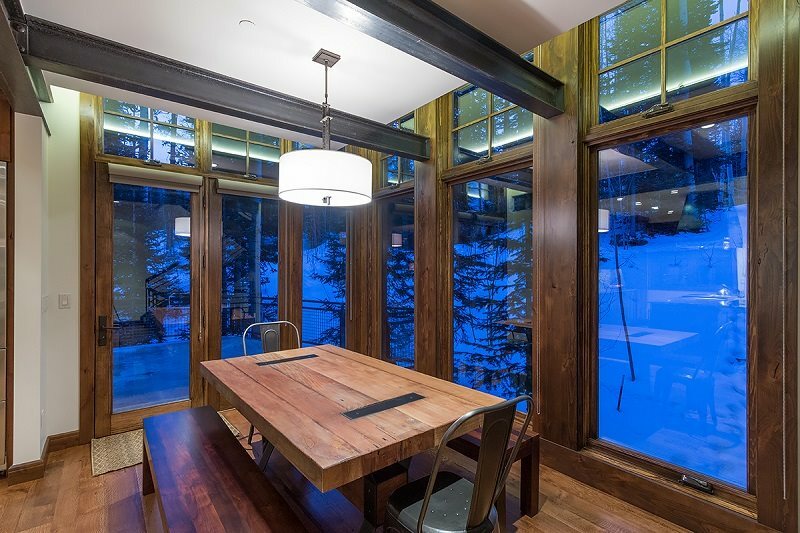 Entering the attractive front door to Vista House brings you through a foyer to the open Great Room, a welcoming space under a soaring ceiling and towering windows that are filled with front row views of the Sneffels Range. 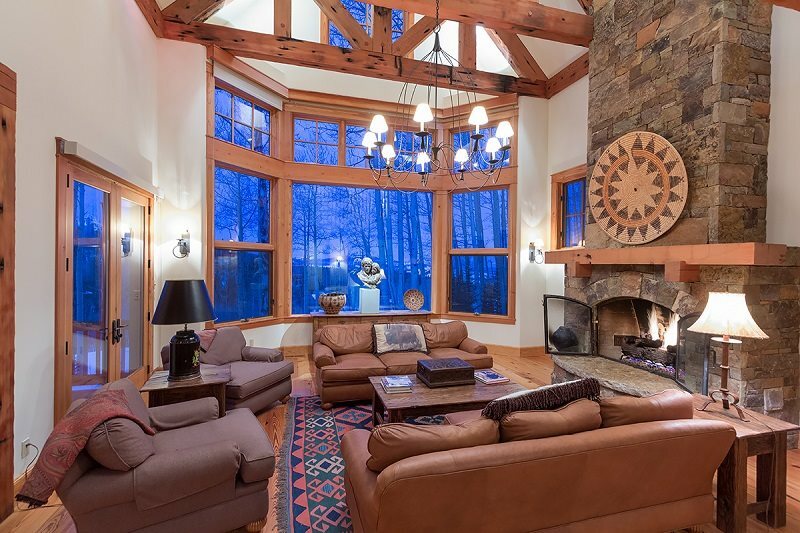 The concrete floors are warmed with comforting in-floor radiant heat and the leather furniture package invites your group to lounge and enjoy the setting in front of the native stone fireplace. 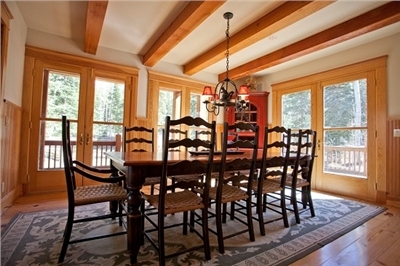 Adjoining the Great Room is the formal dining room with seating for 8. The expansive, open kitchen features granite counters, dacor oven and range, Sub Zero fridge and 3 bar stools for extra seating. 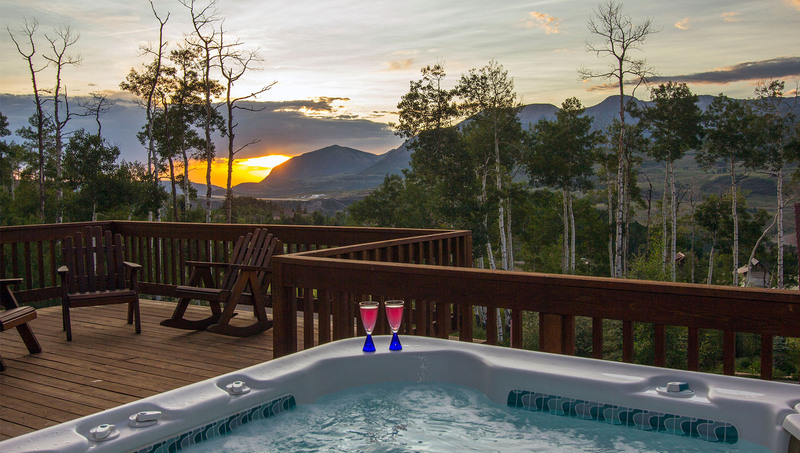 Step out to the inviting patio and back yard area, popular among the resident deer, and enjoy a soak in the private hot tub with 360 degree views. Off the entry foyer is the first guest bedroom, with queen bed and en suite bath with a shower/tub combo. Taking the stairs up from the Great Room brings you first to the loft lounge, a spacious and comfortable area that extends the master suite. Continue straight ahead into the Master Bedroom where you find a King bed, vaulted ceilings, a private deck and double-loaded views. The en suite features a large shower with twin shower heads, a jetted soaking tub, a large walk-in closet and a double vanity sink. The second guest bedroom is found down the hall still on this top floor of the home. It has a Queen bed and en suite bath with a shower/tub combo. Back downstairs to the main level, go through the kitchen to the garage mud room to find the private washer/dryer and the spiral stairs leading to the fourth bedroom. 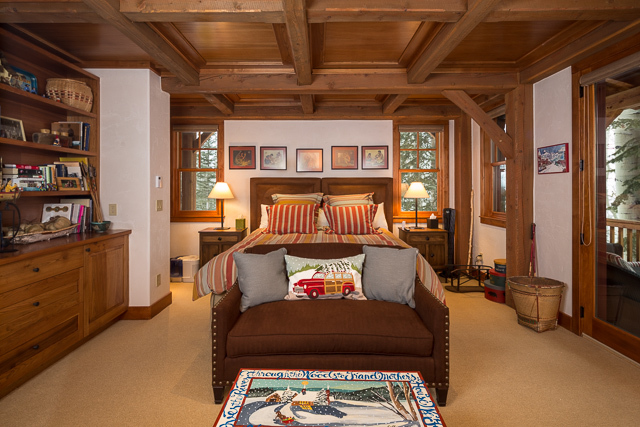 This room, inspired by a mountain lodge, has two twin beds, a twin bunk and full bath with a stand up shower. Vista House has an attached 2-car garage. The home is equipped with wireless Internet and Cable TV for the Great Room's large flat screen TV. 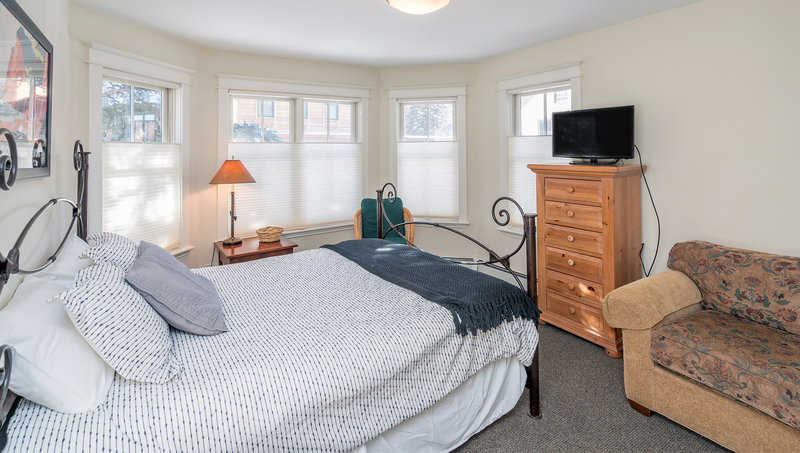 Enjoy a charming residential setting in this carriage house located on Pacific Street, a 1-bedroom/1-bath with a queen bed and queen-sized sleeper sofa. 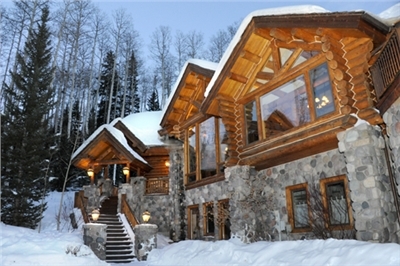 This unique home is a perfect mix of small and quality and is part of our Sea-to-Ski Luxury Collection. Up the stairs, enter the apartment and find a compact and tastefully decorated kitchen and living room. 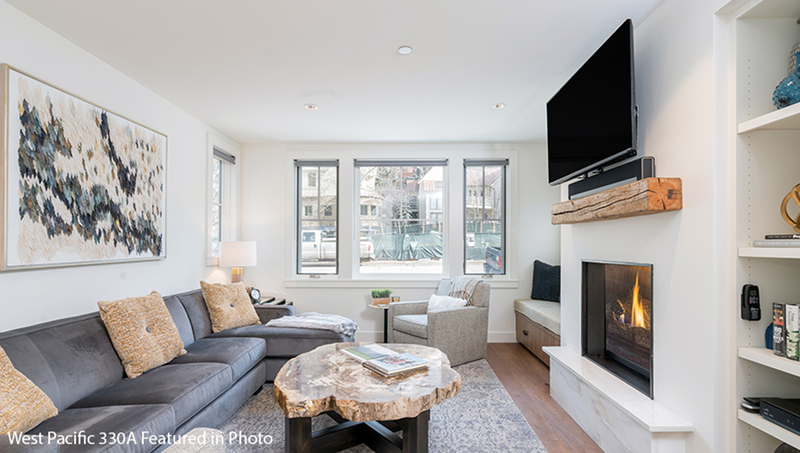 With hardwood floors and stainless appliances, the spaces blend form and function, including a gas fireplace and flat-screen TV w/DVD. The couch in the living room folds out to a queen-sized sleeper sofa for additional bedding. 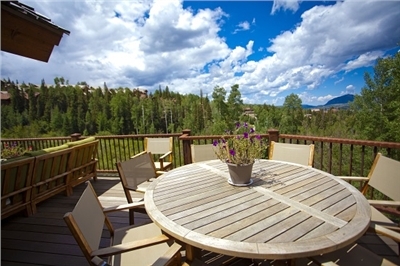 The small deck off the living room has great views of the ski area, Box Canyon and surrounding ridges, as well as Adirondack chairs and a gas grill. Downstairs is the bedroom with queen bed and bathroom with steam shower. The apartment has its own washer/dryer and free wireless Internet access. On-street parking by permit is included. Lift 7, Coonskin, is two blocks to the west while Lift 8, Oak Street, Gondola is two blocks east. 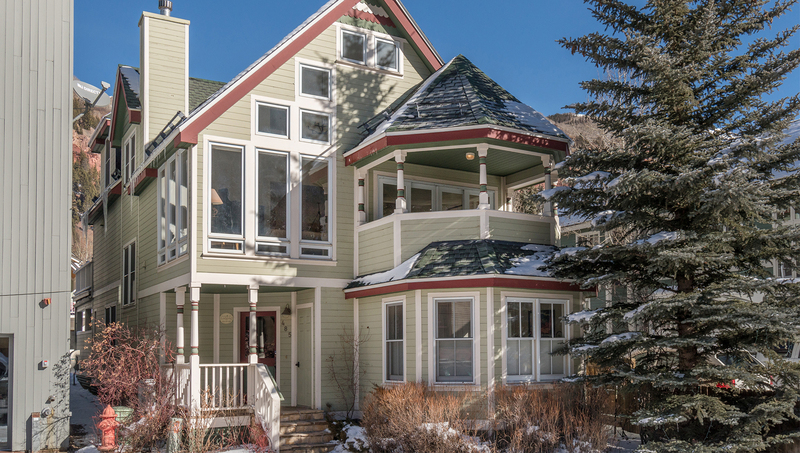 Historic downtown Telluride is a five-minute walk away.